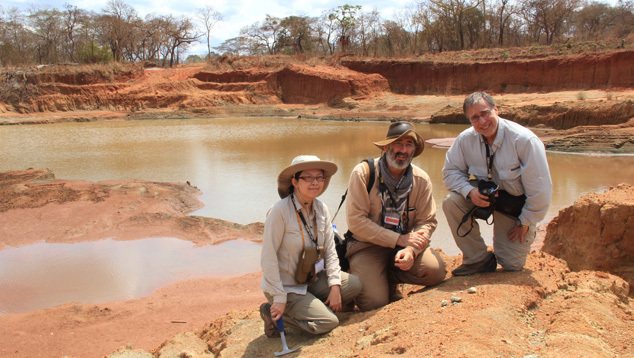 The GIA team visiting Maninge Nice, Montepuez, Mozambique, consisted of—from left to right—Tao Hsu, Vincent Pardieu, and Andrew Lucas. Photo by Stanislas Detroyat. Gemfields’ first Mozambique ruby auction took place in Singapore from June 12–17, 2014, and marked a milestone for the global ruby trade. Unlike diamonds, colored stones face dramatic supply fluctuations, and pricing has always been problematic. 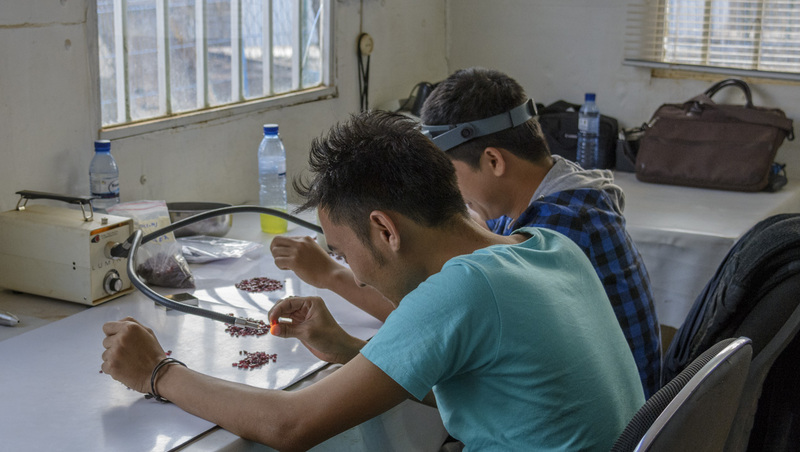 The Gemfields operation offers the trade an opportunity to expand the consumer base for responsibly sourced, consistently graded, and reliably supplied ruby. 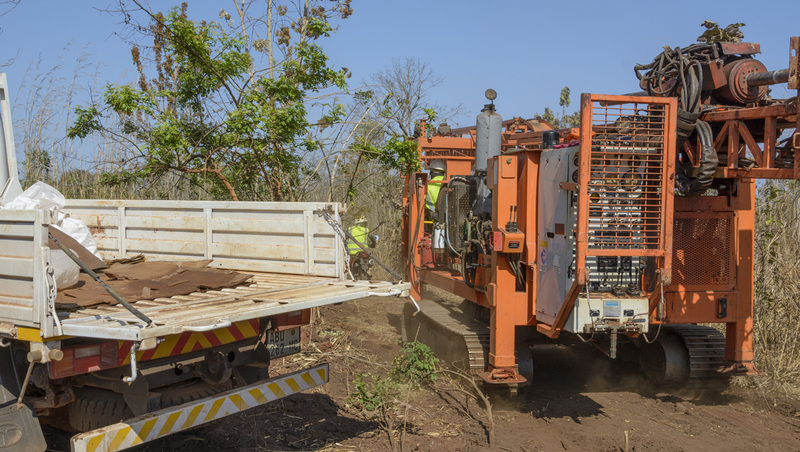 The US$33.5 million revenue generated by the inaugural auction put the spotlight on one of the world’s largest ruby deposits, located in Montepuez, Mozambique. Advanced knowledge and up-to-date trade information have always been at the center of GIA’s consumer protection mission. 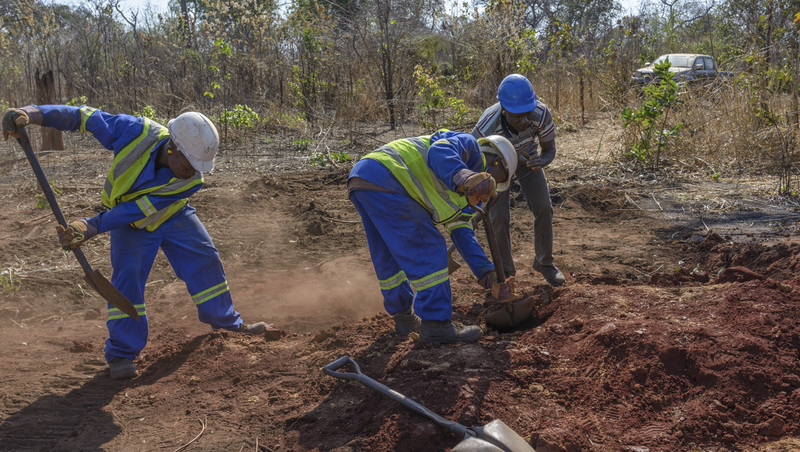 Since the first Mozambique ruby discovery, GIA field gemologists have been first to appear at Montepuez mining sites to collect samples, witness progress, and document the entire mine-to-market process. 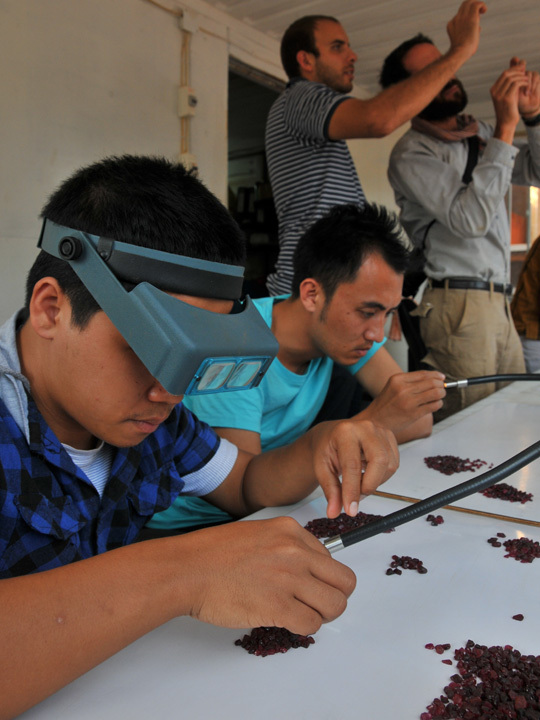 GIA’s field gemology program is designed to help the public benefit from the first-hand knowledge obtained. 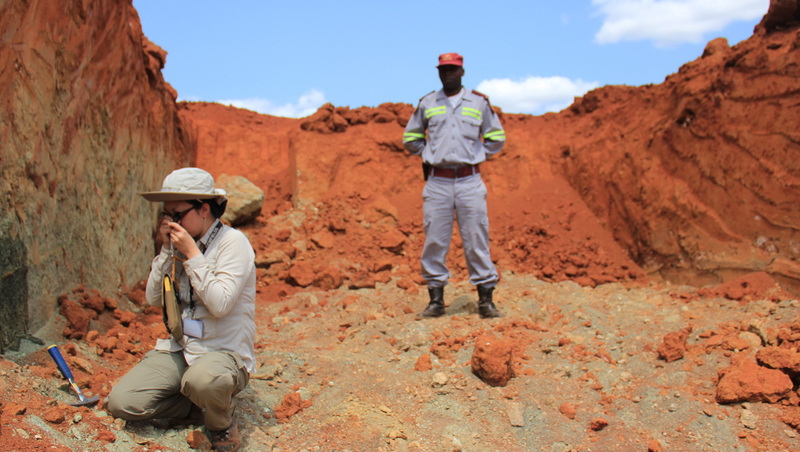 In September 2014, GIA researchers Tao Hsu, Vincent Pardieu, and Andrew Lucas, visited the Montepuez ruby deposit. This was Vincent Pardieu’s third visit since its discovery in 2009. The team was able to witness the evolution of this major deposit. Pardieu noted that it was uniquely situated to succeed, with its rich and easily mined resources and convenient location near a major port and well-traveled roadway. This report presents a complete update on the deposit and the bulk sampling and distribution of its gems. Our host, the Montepuez Ruby Mining company (MRM), is currently still in the bulk sampling stage. 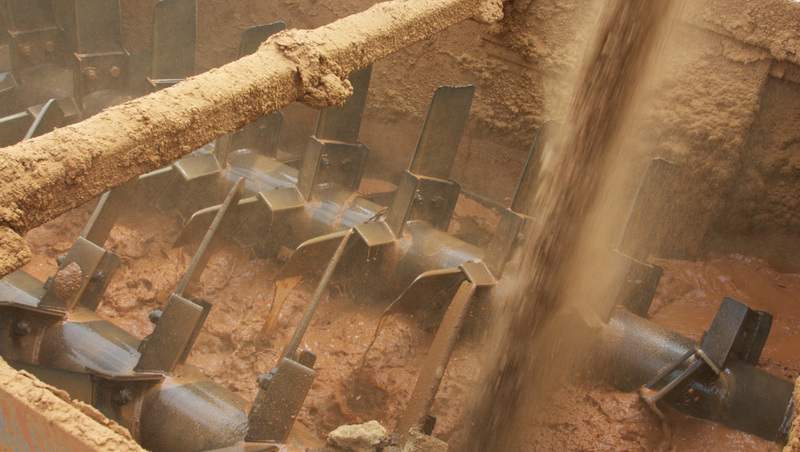 This involves the removal of large mineralized rock, typically from small pits. The rock is selected to represent the potential ore body and used to perform mineral processing tests as required for resource estimation. This will facilitate any future decisions to be made about building large-scale mine operations. All production currently being sold at auction is the direct result of this bulk sampling process. Mozambique is located in southeastern Africa along the Indian Ocean. 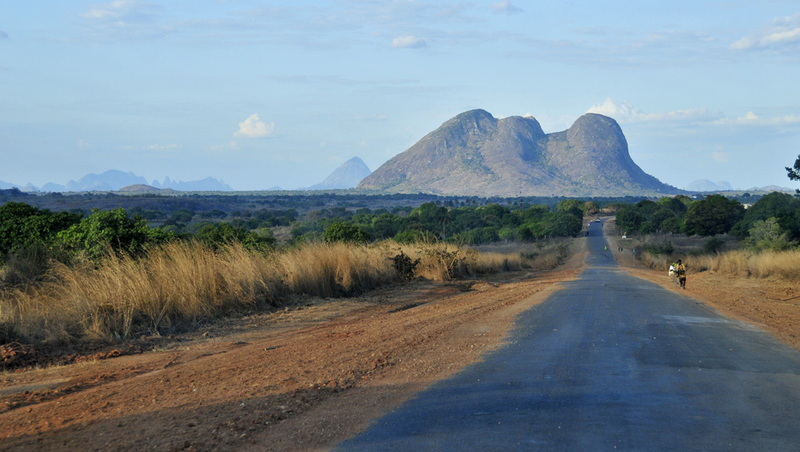 Separated from Madagascar by the Mozambique Channel, it is bordered by Tanzania to the north, South Africa to the south, and Zimbabwe, Malawi, and Zambia to the west. Its total area is 801,590 square kilometers, about twice the size of California. 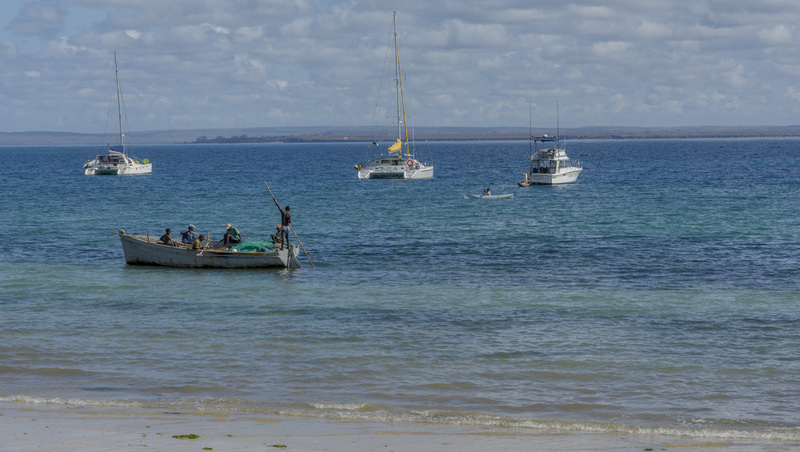 Mozambique has 2,470 kilometers of coastline, much of it very beautiful. The climate is mostly tropical. in the world. Its ruby mines are concentrated in the country’s northeastern corner. Illustration by Peter Johnston/GIA. Map adapted from Richard W. Hughes, 2009. 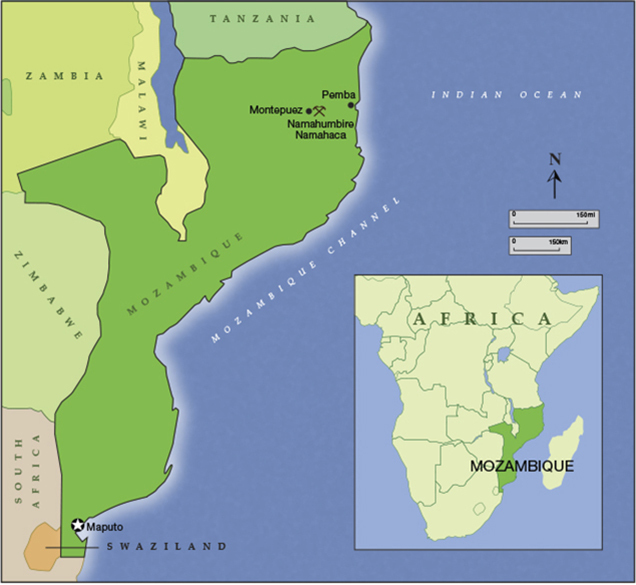 Mozambique achieved independence in 1975, after nearly 500 years as a Portuguese colony. Portuguese is still the official language. Civil war and severe droughts plagued the country until the early 1990s. In 1992, the United Nations brokered a peace deal that ended the civil war. Then, in the early part of this century, the country was hit with severe flooding. 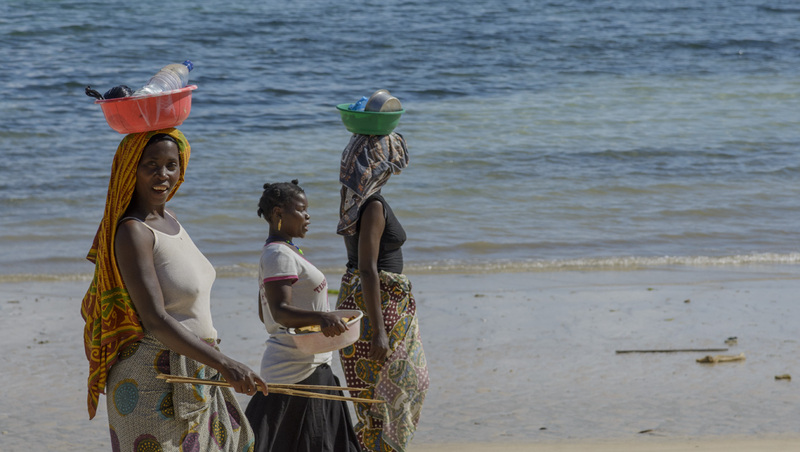 While Mozambique has been hindered by poverty and reliance on foreign aid, its economy grew at an annual rate of 6% to 8% in the decade leading up to 2013, one of Africa’s strongest growth periods. Its rich resources of natural gas, coal, titanium, and hydroelectric power may lead to substantial foreign investment and put the country on the path to economic independence. Agriculture is another important part of the economy. 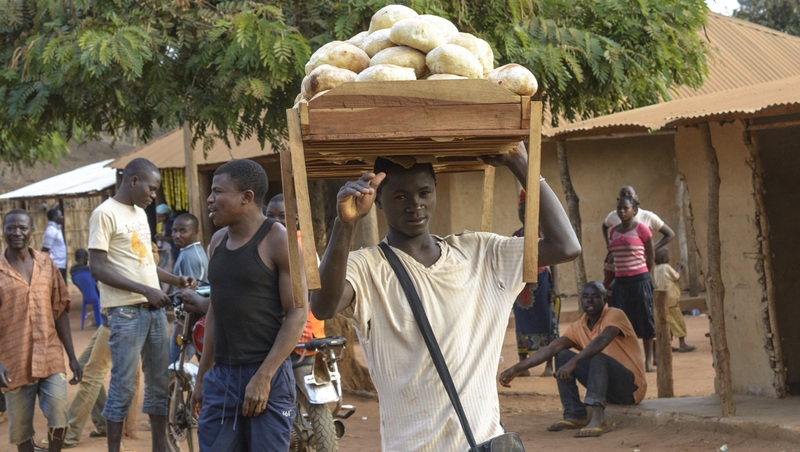 Eighty-one percent of Mozambique’s workforce is employed in agriculture, with extensive production of cotton, cashew nuts, sugarcane, tea, manioc root, tapioca, fruits, potatoes, beef, and poultry. Ruby mining in the northeastern part of the country is one of the newer economic sectors. 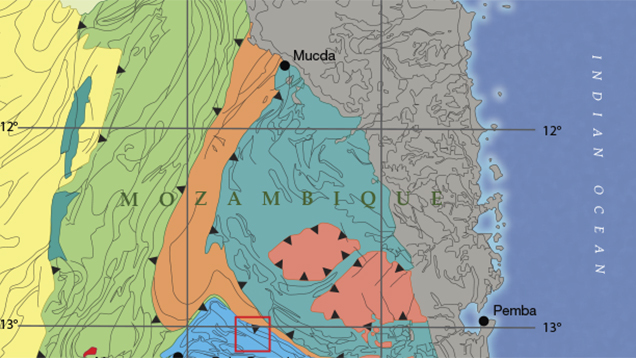 The history of corundum in Mozambique can be traced back to the colonial period, which lasted from 1505 to 1975. 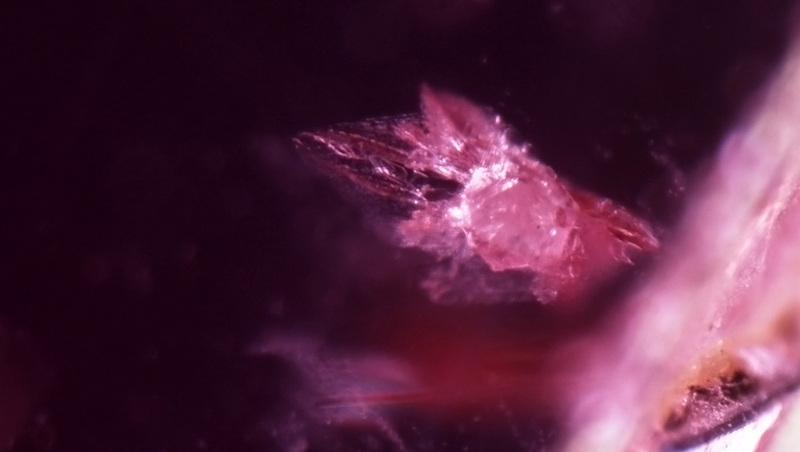 While corundum had been discovered in the 1500s and was known to exist throughout the colonial period, no real commercial exploitation had taken place. In the spring of 1991, Gems & Gemology reported the sale of cabochon-grade rubies from Mozambique at the Tucson show. Little more was reported until 2005, when author VP first heard about rubies from Mozambique while speaking with Thai heat-treaters (“burners”). They informed him that some of the material being treated came from Tanzania and Mozambique. 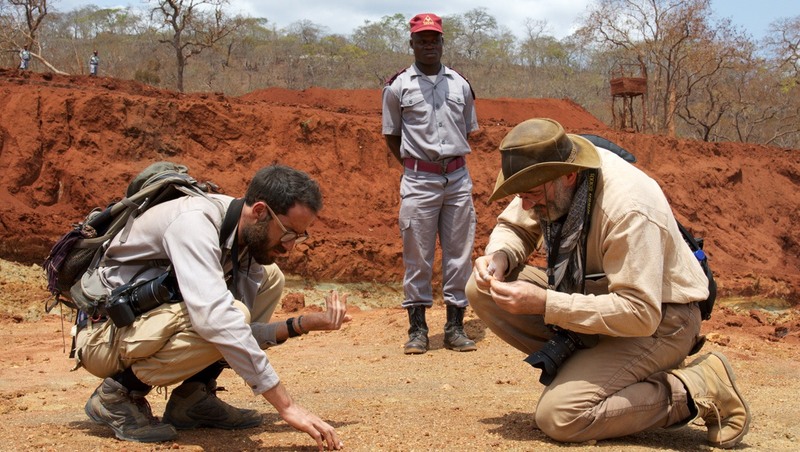 In 2008, reports surfaced in Tanzania of a ruby deposit in Mozambique. 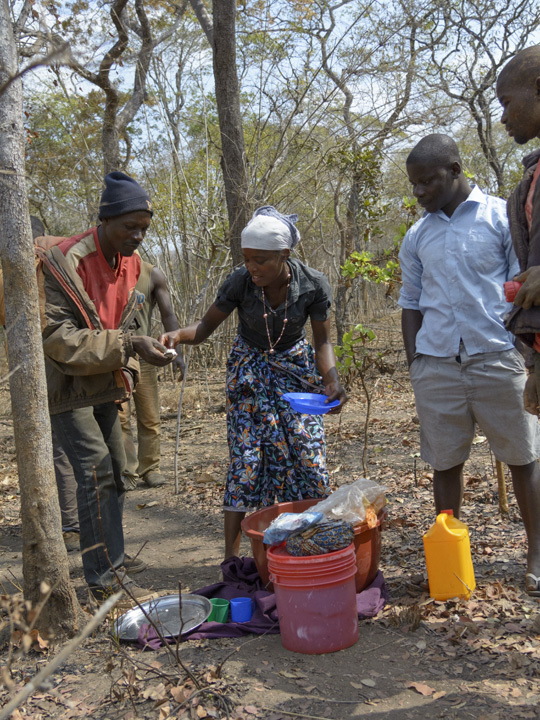 Indeed, rubies were discovered by local hunters near M’sawize village, inside the Niassa National Reserve. GIA published a preliminary study on these stones by Pardieu and Thanachakaphad (2009). The site was mined illegally for several months before being closed by the authorities in the summer of 2009. 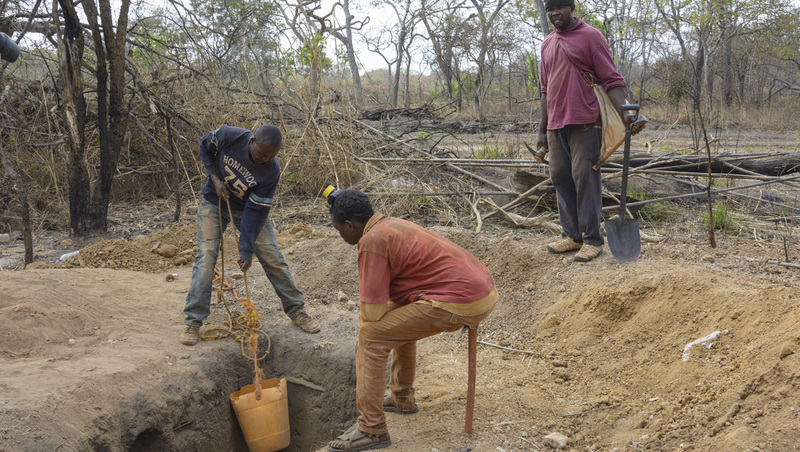 The closure of that deposit was quite successful as most of the illegal miners, known as garimpeiros, moved to the Montepuez area in the Cabo Delgado province, where in April 2009 another ruby discovery occurred near Namahumbire village. This time, a local man named Suleman Hassan happened upon the gems while chopping wood. Vincent Pardieu visited the ruby deposit near Montepuez in December, 2009. Here he is with a security officer. Photo by Richard Hughes. In the Fall 2009 issue of G&G, McClure and Koivula reported preliminary observations of rubies from these two new deposits in Mozambique. 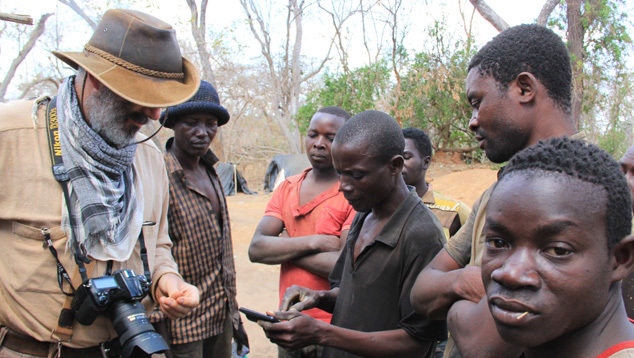 A GIA field gemology team, led by author VP, first visited the Niassa and Montepuez deposits in November and December 2009, respectively, for onsite collection of samples to help the GIA Laboratory keep its reference collection up to date. By 2010, Mozambique rubies already dominated the Thai market, although the stones were sourced mainly from unlicensed miners and merchants. 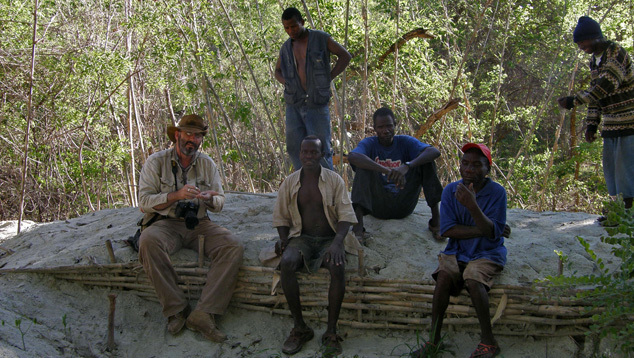 Vincent interacted with small-scale miners near Namahaca village in the Montepuez area, in December 2009. Photo by Mark Smith. 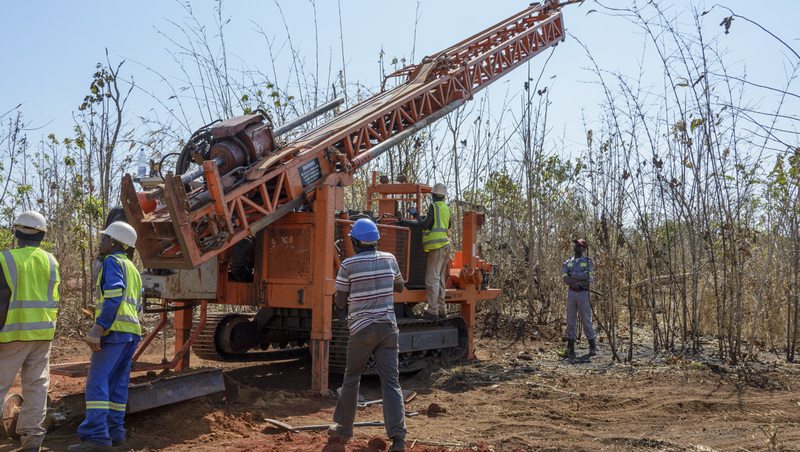 A new era for the ruby deposit in Montepuez began in June 2011, with the partnership between Mozambique’s very own Mwiriti Ltd. and the British multinational company Gemfields. The newly formed company was named Montepuez Ruby Mining Company (MRM). Ever since, MRM has spent considerable capital and effort to improve infrastructure, machinery, staffing, security, and public relations. 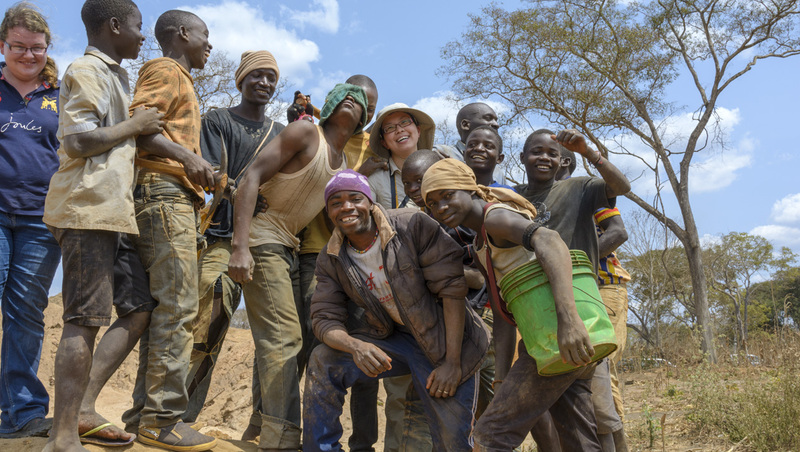 In September 2012, GIA’s field gemology team returned to the site. 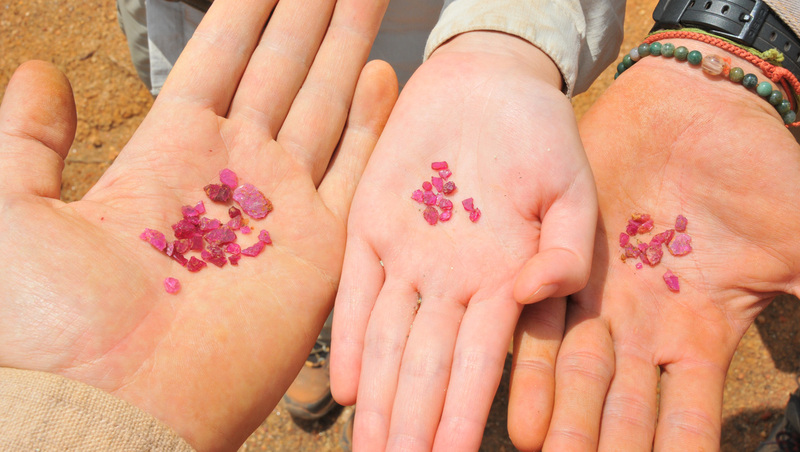 This expedition resulted in a complete study of Montepuez ruby samples, which was published on GIA’s website. The most encouraging recognition of this joint venture was a visit by the president of Mozambique on April 20, 2013. In June 2014, Vincent Pardieu and Andrew Lucas traveled to Singapore to report on MRM’s first ruby rough auction. They subsequently visited MRM and Mozambique in September 2014 to collect new reference samples and prepare an update on bulk sampling activity there. 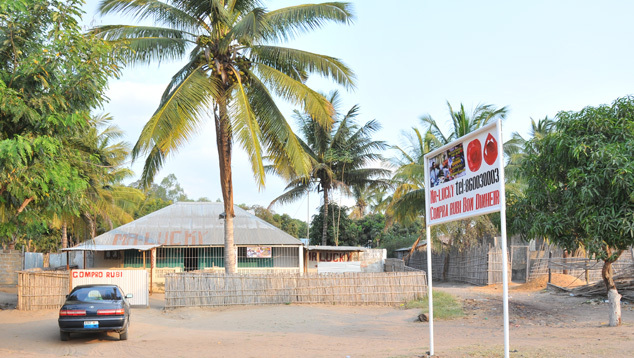 While the public is largely unaware of Mozambique as a source for rubies, the deposit near Montepuez is considered by the trade to be the largest ruby supplier in the world. 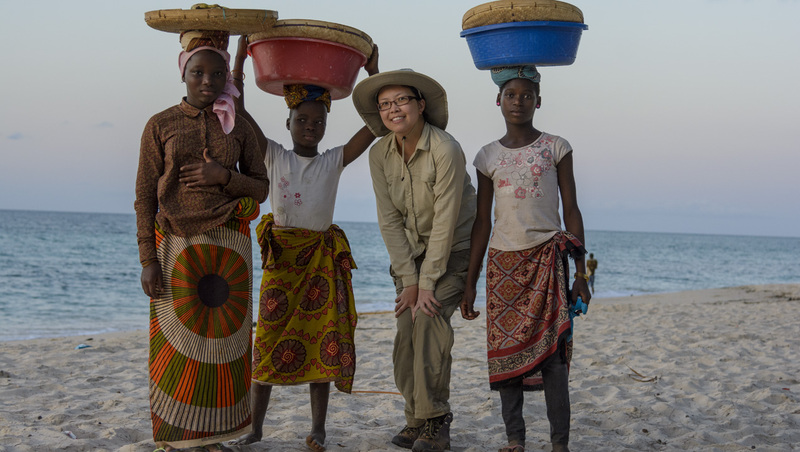 Northeastern Mozambique is located at a geologically critical junction between the north-south trending Mozambique Belt and the east-west trending Zambezi Belt. 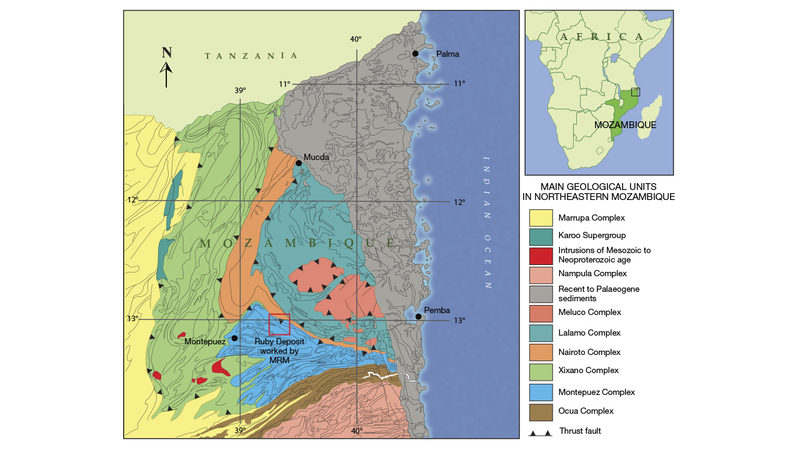 Both are “treasure-bearing” Neoproterozoic (approximately 800–500 million years old) orogenic belts within the global Pan-African tectonic framework. 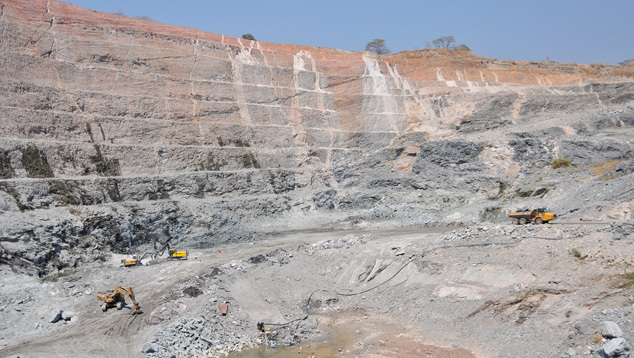 Several major geological complexes are separated by major thrusts and shear zones. 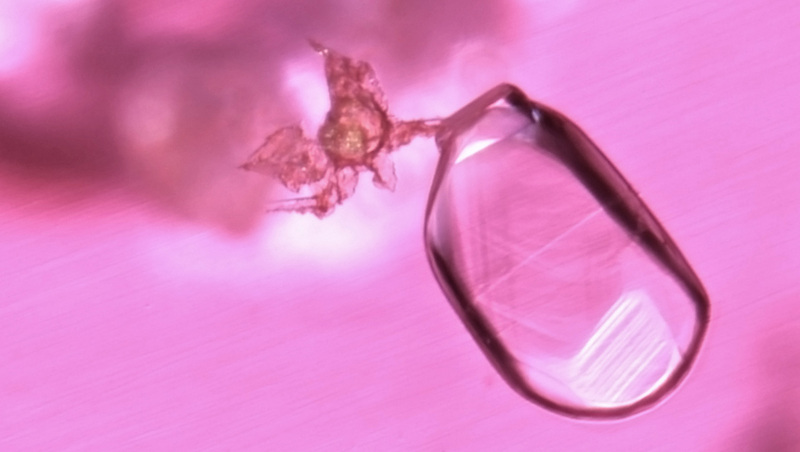 Complex thermal and deformational events provided ideal temperature and pressure for forming ruby, garnet, and other economic minerals. 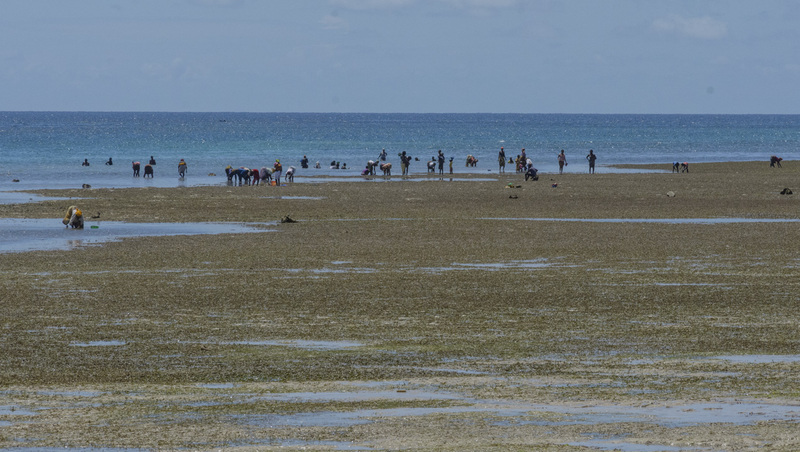 About 150 km to the west of the beautiful coastal city of Pemba lies the Montepuez ruby mine. It's located within the wedge-shaped Montepuez Complex. Its mineral assemblages indicate that the whole complex underwent amphibolite-grade metamorphism (generally at a pressure of 0.4–1.1 GPa and a temperature of 550–750°C). The composition of these rocks ranges from granitic to amphibolitic, while quartzite and marble can be found inside and outside the concession property. The rocks are also strongly folded into tight isoclinal folds on all scales and were later cut by a number of shear zones trending northeast to southwest. The MRM concession is located on one limb of a fold with a sub-vertical axial plane striking east-west. At least four different phases of deformation occurred in this area. 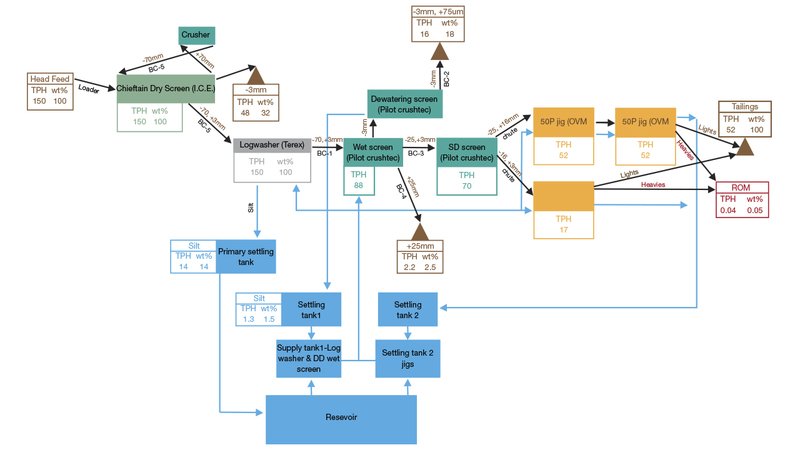 The strong deformation history complicated the rock units on all scales, making the exploration and prediction of the primary ore very complex. 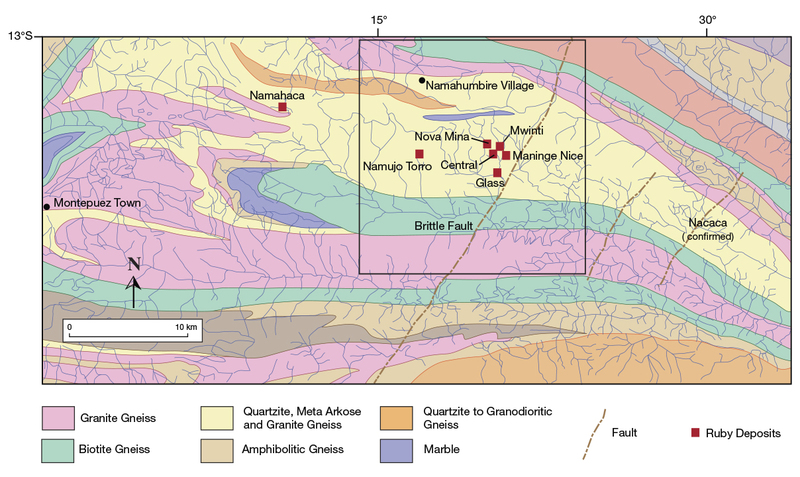 The Montepuez ruby deposits are both primary and secondary. Ruby forms only under a limited range of pressure-temperature conditions and only with a sufficient supply of aluminum and chromium and oxygen. Around Montepuez, the ruby formation seems to result mainly from a metasomatic process. So far, rubies have only been found associated with feldspar, mica, and amphiboles in amphibolite. No rubies have been found in the marble. 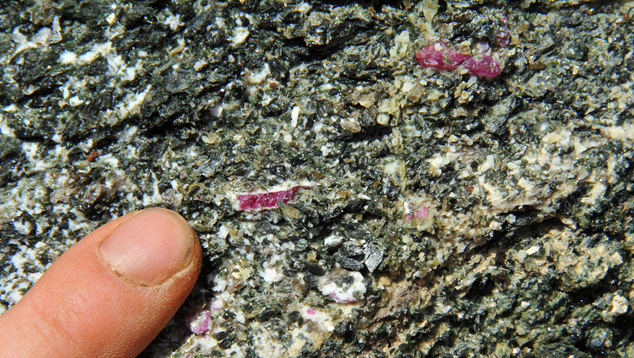 At Maninge Nice, rubies are associated with feldspar-rich veins intruding into an amphibolite, as seen in this photo of an MRM exploration trench, taken during the 2012 expedition. Photo by Vincent Pardieu/GIA. 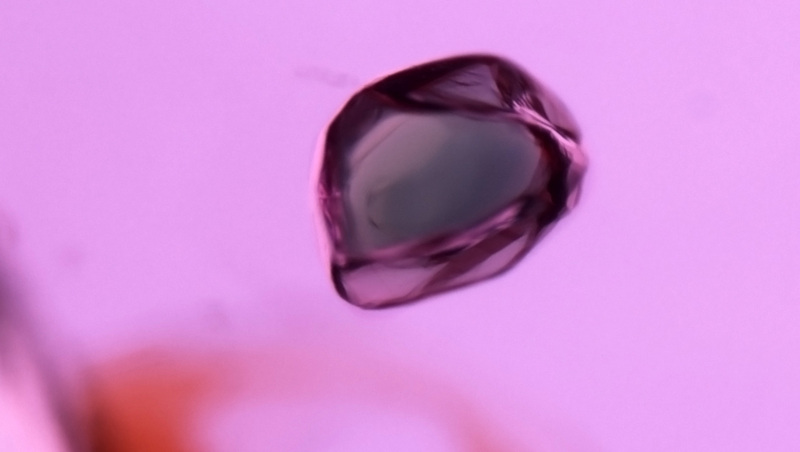 Rubies formed when fluid derived from the parental magma interacted with the host rocks under a silica unsaturated environment. Until now, only one primary deposit has been exposed in the MRM bulk sampling concession. In the wall of this pit, contact between the topsoil and the weathered ruby-containing amphibolite is obvious. The weathered amphibolite is very fragile and can be easily smashed by hand. Ruby is found in close association with white feldspar, mica, and dark green amphibole. Core drilling data indicate that the amphibolite extends about 30 meters below the surface and lies on top of the basement gneiss. The whole amphibolite unit strikes roughly east-west. This shows a close-up of ruby in amphibolite, associated with amphibole, mica, and feldspar. Photo by Vincent Pardieu/GIA. After hundreds of million years of erosion, the secondary ruby deposits in Montepuez are far easier to discover and work than the primary deposits. 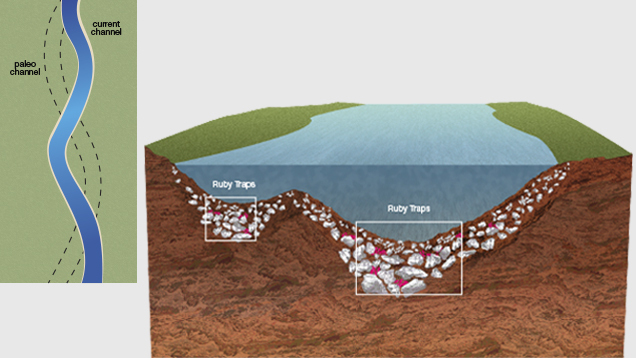 Rubies liberated from the host rock were transported and concentrated by water and eventually settled in the alluvial, colluvial, and eluvial deposits being worked on today. Rubies tend to concentrate at the bottom of depressions along the former river bed. The large gravels help to trap the rubies as well. Illustration by Peter Johnston/GIA. The map of the concession shows that this area has a well-developed drainage system. The water flows generally from north to south, as dictated by the local topography. Hundreds of millions of years ago, the stream beds were at different positions. 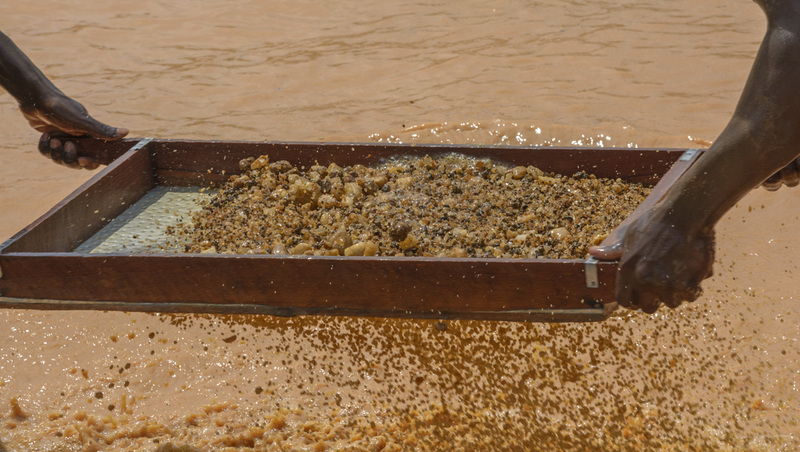 According to MRM’s head geologist, most of the unlicensed miners are working along the present-day stream channels, as they are quite recognizable and easy to work. Along with these channels, the targets of MRM’s exploration program are the richest paleochannels, where large reserves of fine rubies are buried. 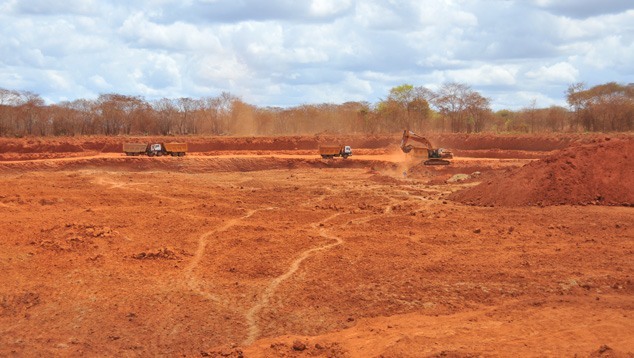 Pit 3 in the Mashamba area, the largest pit being worked by MRM, is located along one of the main paleochannels identified by company geologists. 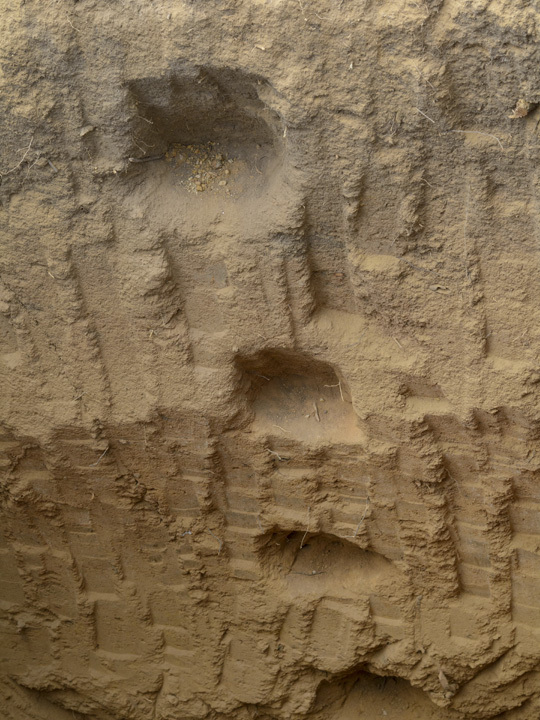 On the wall of this pit, some superb cross-sections of former river channels can be observed. From the edge to the bottom of the “traps,” there is a clear increase of gravel size. Due to gravity, heavier gravels tend to settle and concentrate at the bottom of a depression. The larger gravels slow the water speed more than the smaller gravels. Since the specific gravity of ruby is relatively high, it tends to settle along the bottom of a depression with other heavy minerals. When the flow speed slows, it also favors the deposit of rubies. Thus, a higher concentration of ruby can usually be found at the bottom of the trap. Traps for heavy minerals occur at different positions along the river channel, wherever the water current slows. The traps themselves work as natural jigs, and these ruby “traffic jams” are ideal locations for gem hunters. 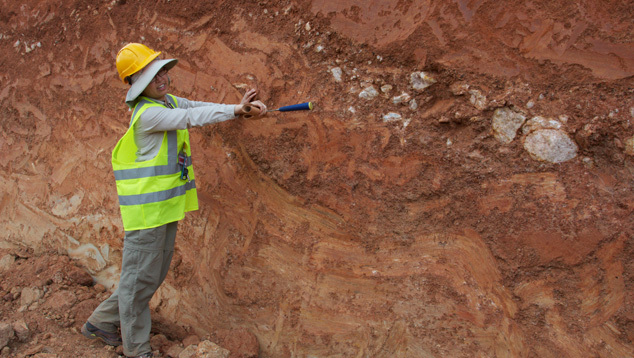 Doctor Tao Hsu points out an area in the paleochannel with large boulders. These boulders are perfect traps for gems with heavy specific gravity, such as ruby. Photo by Andrew Lucas/GIA. Since there are numerous granitic rocks in the area, the gravels are mainly quartz crystals and aggregates of different sizes. The shape of them and their sharp corners indicate that they were not transported for a long distance and are probably close to the source rocks. 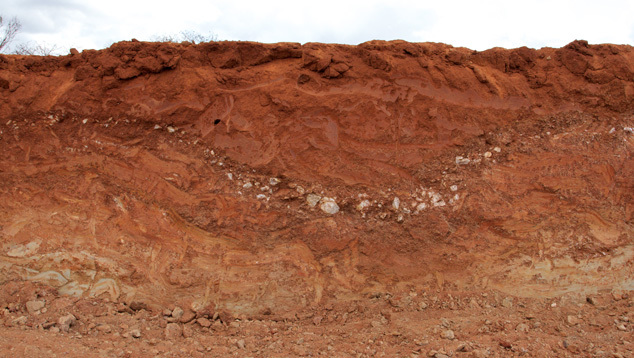 The focus of secondary deposit exploration is to find old stream channels and better define the distribution of this ruby-bearing gravel layer. The total size of the MRM concession is roughly 400 square kilometers. 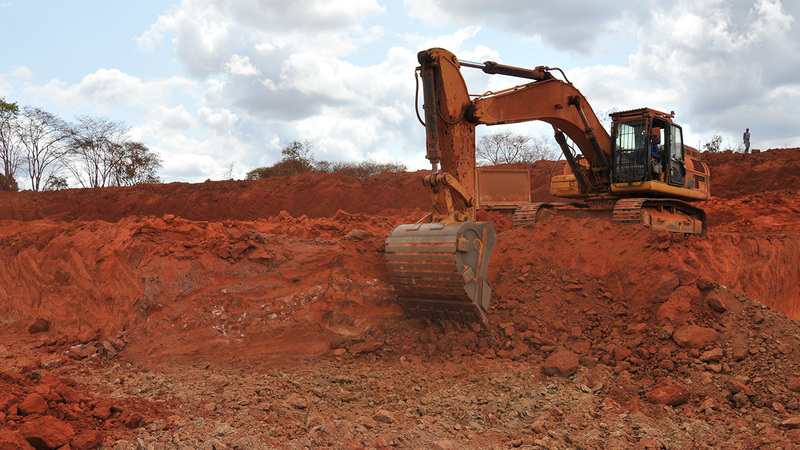 The mine has both primary and secondary deposits, but most of the bulk sampling takes place at the secondary deposits. Bulk sampling is planned for both types within the current fiscal year. MRM gives its bulk sampling pits numerical names, but many go by the original names used for the area. The only pit with a primary deposit as well as secondary gravels being sampled is at Maninge Nice, a local name given because of the “nice” stones that have come from there. This view looks over the pit at Maninge Nice, so-named because of the “nice” stones it yields. Photo by Vincent Pardieu/GIA. Another major bulk sampling area is Mugloto. This area also has numerical names for its pits, such as Mugloto 1, Mugloto 1A, Mugloto 2, and Mugloto 3. 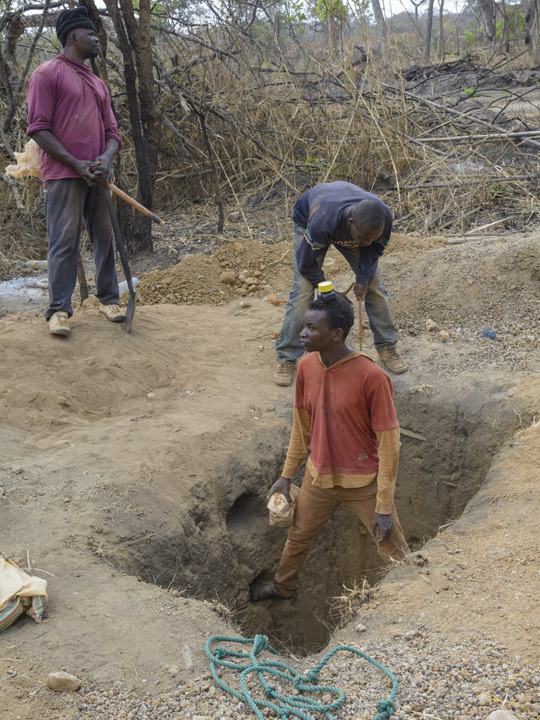 The highly important Mugloto pit 3 is in an area called Mashamba, a local name for the maize once farmed on the site. Pit 5 is in an area called Mercado, which means “market” in Portuguese, as it used to be an illegal miners’ market. 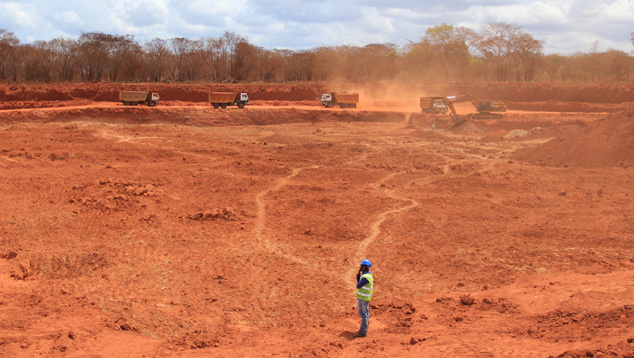 The main bulk sampling pit at Mashamba pit 3 in the Mugloto area is the most productive pit, by value. Photo by Stanislas Detroyat. 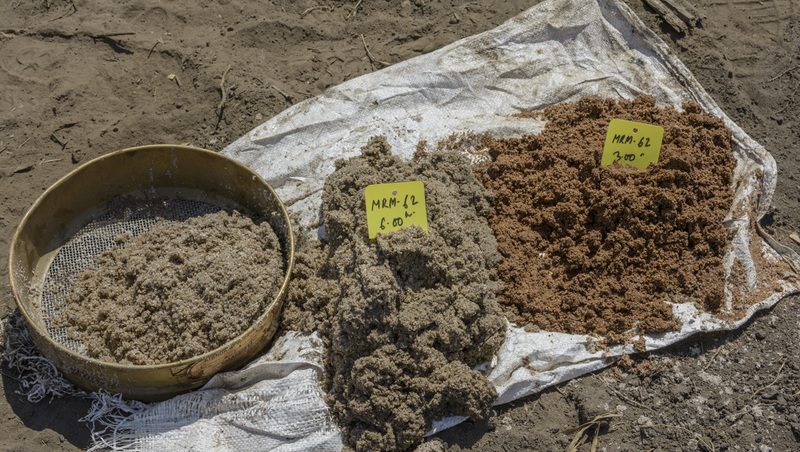 MRM emphasizes the secondary deposits, which are easier to sample and host a concentration of fine stones because most of the fractured and included stones were ground into sand by weathering. However, perhaps their most important reason for focusing on secondary deposits is to protect them from being exploited by unlicensed miners. Garimpeiros gather near their mining pit in the Mugloto area. Photo by Vincent Pardieu/GIA. Pit 3 in the Mugloto/Mashamba area is a perfect example of this strategy. In these secondary deposits, everything above the gem-bearing gravel is overburden. They sample the gravel down to bedrock. In pit 3, MRM has often used two excavators. One excavator strips the overburden down to the gem-bearing gravel. At that point, the second excavator comes in and loads the gravel into trucks that take it to the processing plant for washing. 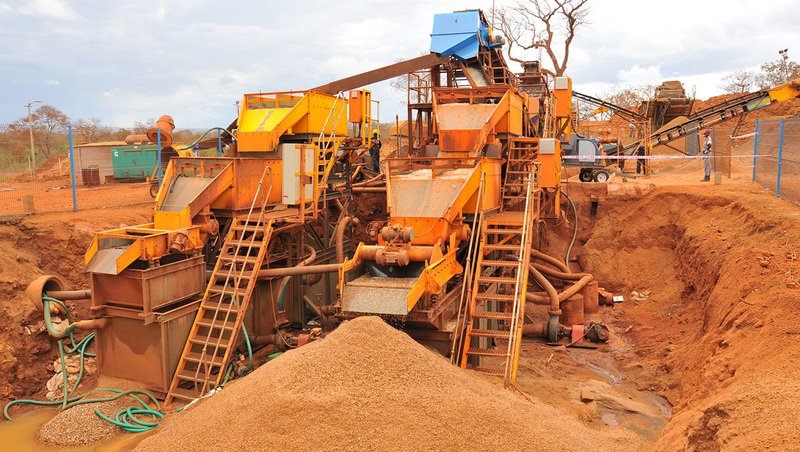 This process allows for one thousand tons of ore per day to be processed for bulk sampling. 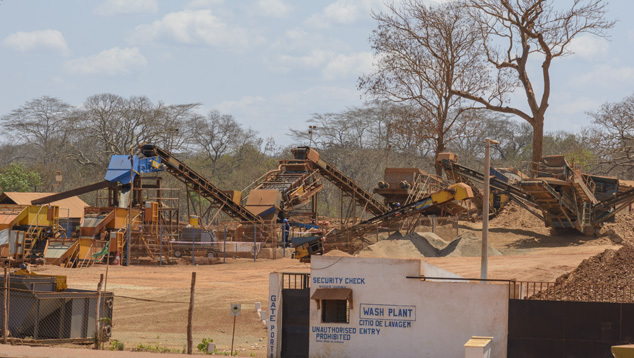 At the time of our visit, 20,000 tons of primary ore had been sampled from Mugloto/Mashamba pit 3. The current operation at pit 3 is 75 to 100 meters long. But with auger drilling and sampling, pit 3 has proven to have 400 by 400 meters of gem-bearing gravel that is about one meter thick. A paleochannel in pit 3 of the Mugloto area shows a layer of large boulders that tend to trap the rubies. The gravels that trap the most rubies are usually at the bottom of the channel and not very deep. Photo by Andrew Lucas/GIA. The long-term strategy for these secondary pit mines, like all bulk sampling operations at MRM, is largely dictated by the geology. 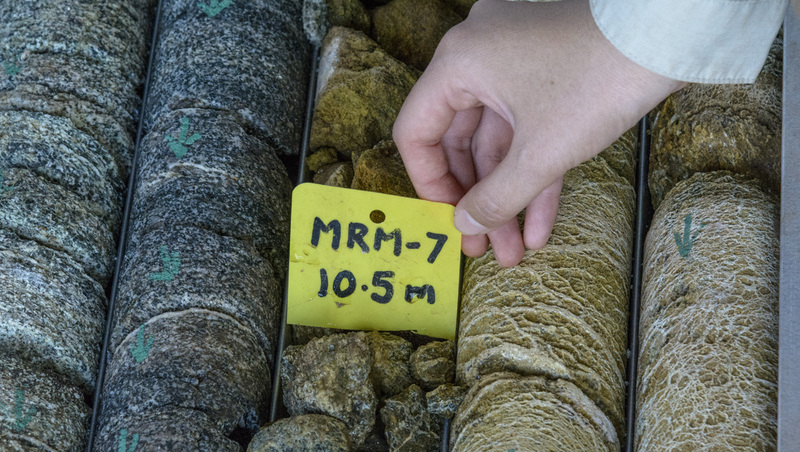 MRM has opened several bulk sampling locations based on exploratory auger drilling and on small 50 meter by 50 meter pits that all follow the same paleochannel. 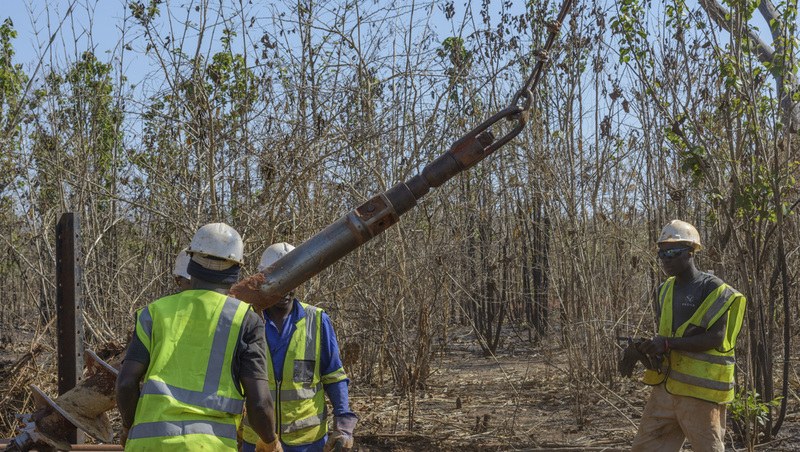 The company plans to join pits 1, 2, 3, and 3 East in the Mugloto/Mashamba area at some point, forming a massive pit operation along the paleochannel. This paleochannel is approximately 4.5 kilometers in length. The width of the pits currently varies from 50 to 150 meters. The large pit joining them along the paleochannel is estimated to be 2.5 kilometers long and expected to become longer. The end result will be a massive colored gemstone pit-mining operation. 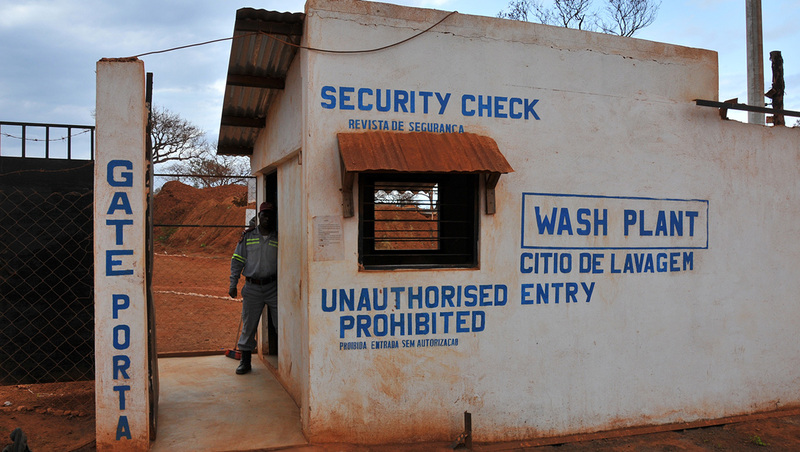 The GIA team, along with some of the MRM hosts, went through a security check while leaving pit 3 at Mashamba. This was the practice when we were leaving bulk sampling operations. Photo by Stanislas Detroyat. MRM conservatively predicts that they will remove 1.7 million tons of potential gem-bearing gravel from the long pit along this paleochannel. 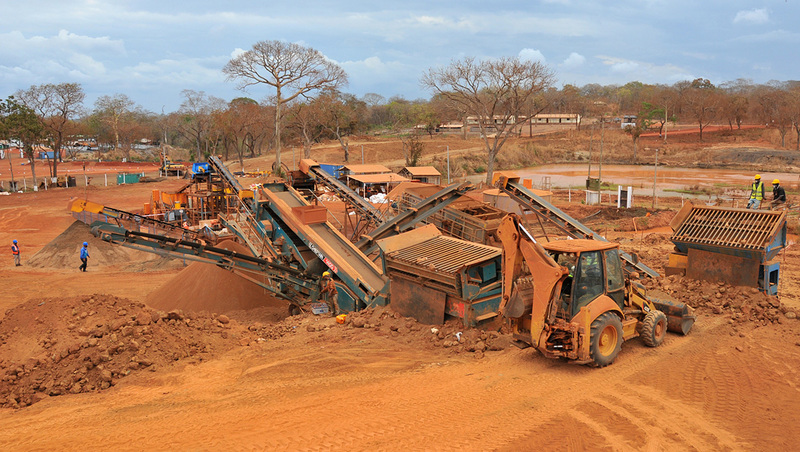 In all, this will involve the handling of 15 million tons of overburden. 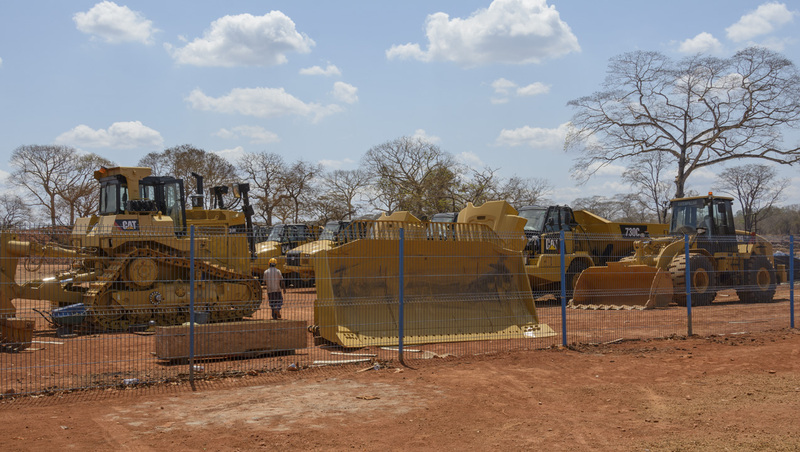 At the time of our visit, MRM was using four CAT 330D backhoe excavators, and another two were scheduled to arrive shortly. 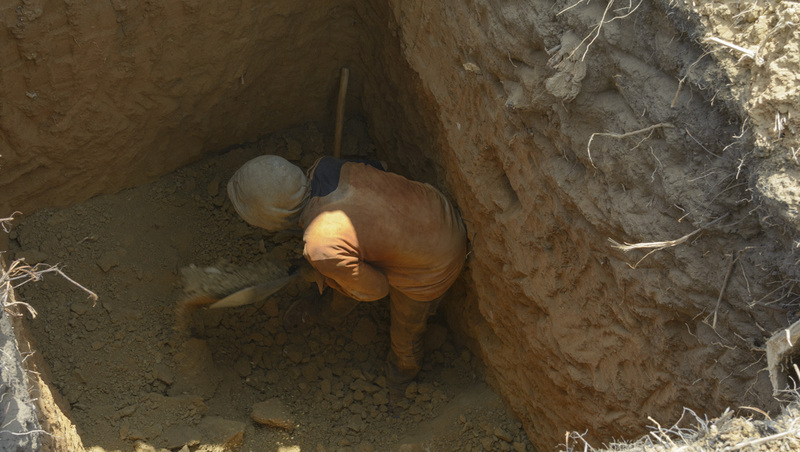 This will allow more pits to be sampled at the same time, the doubling up of excavators in pits identified as crucial, and the starting of new pits. 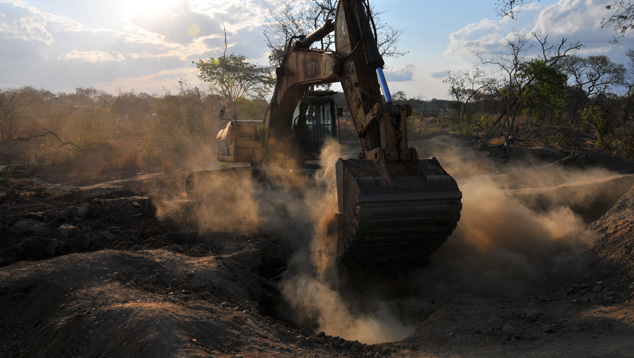 This excavator is closing up an illegal mining pit in the Mugloto area after a security operation cleared the pit of any possible miners inside. Photo by Vincent Pardieu/GIA. As primary deposits go, the one at Maninge Nice is relatively easy to sample. The host rock is soft weathered amphibolite, so removing it is not difficult or destructive to the crystals. 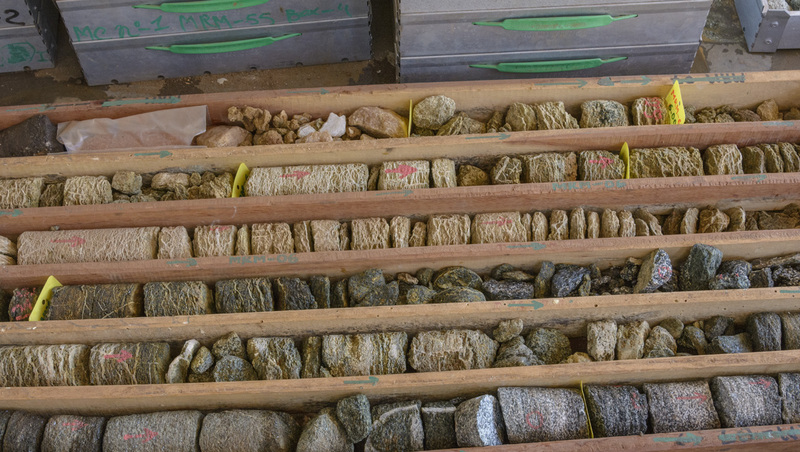 Future sampling at the MRM concession will likely involve more primary rock, and this type of weathered rock has a tremendous advantage in keeping costs down and production high. 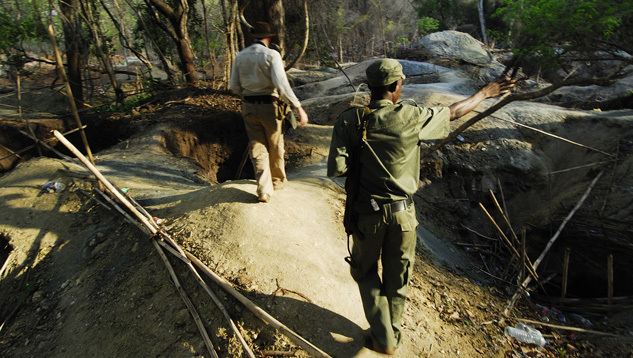 What struck us as observers was how the operation embraced the advantages nature provided in the gem gravels and ruby traps. 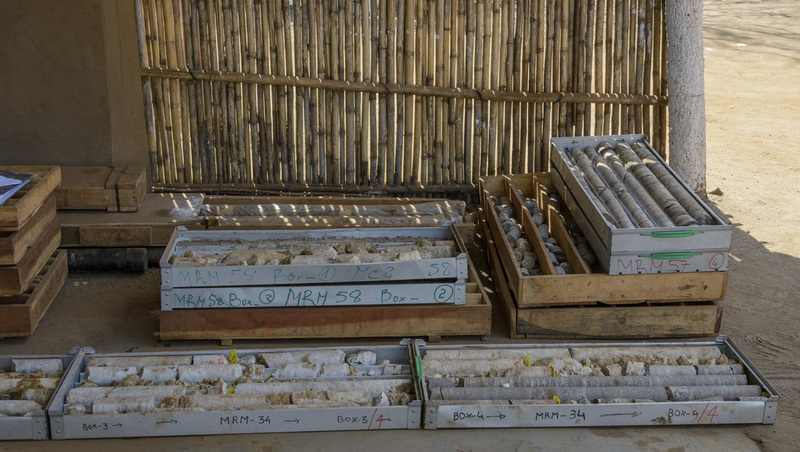 As MRM head geologist Ashim Roy noted, “It is simple, but not easy.” The talented geologists at MRM have worked hard to develop the best methods for exploiting the deposit and protecting it from unlicensed miners. The entire time, we could clearly see the gravels under the topsoil in the pits, and the boulders that formed the ruby traps. Both theoretical and practical bulk sampling were on display. 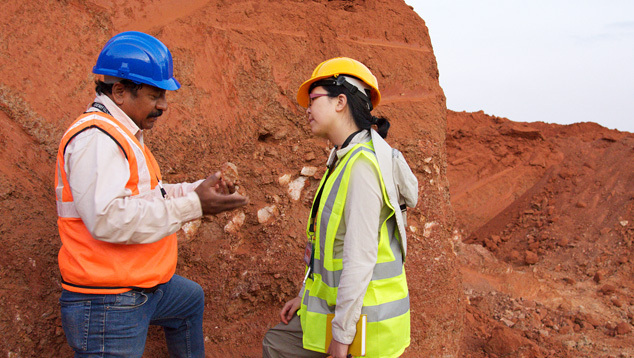 “It is simple but not easy,” MRM geologist Ashim Roy explains to GIA geologist Tao Hsu. He is talking about the challenges he faces as head of geology at MRM in Mozambique. Photo by Andrew Lucas/GIA. MRM’s resource estimation is scheduled to be completed in 2016, and this will give a clearer picture of the potential production figures and the life of the mine. Exploration is in progress for both the primary and secondary deposits. Different drilling methods and strategies are applied to each type. The goal of the secondary deposit exploration is to better define the distribution of the ruby-bearing gravel layer in the MRM concession. Contours of the gravel layer will be constructed from this, as well as data on the concentration of rubies. to complete the drilling. Photo by Andrew Lucas/GIA. 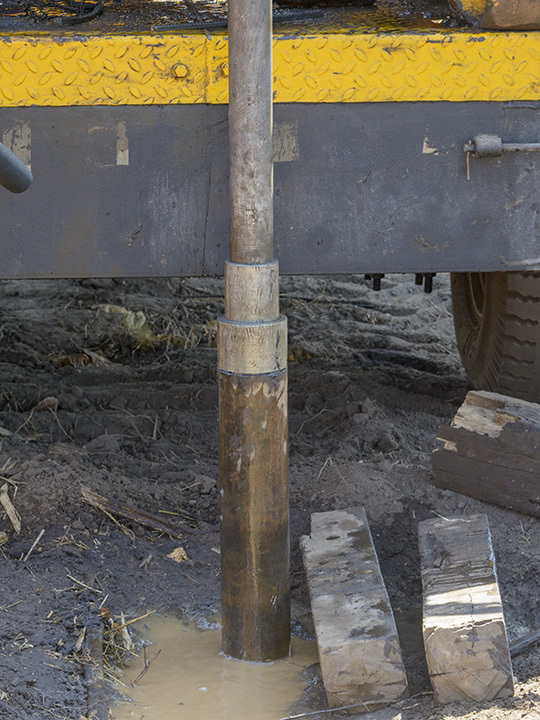 Auger drilling is used to explore the secondary deposits. The rotation of a helical screw driven into the ground causes the screw blade to lift the earth up the borehole. The helical screw traps loose gravel from a secondary deposit. As it is pulled out of the drill hole, the loose gravel can be removed from between the drill blades. This is different from core drilling, where the drilling removes solid or fragmented cores from hard rock. Auger drilling is generally considered an efficient way to explore soft unconsolidated material or weak weathered rocks. Gemfields’ geologists divided the target area into blocks and planned to drill boreholes in 100-meter grids, with a borehole placed at the center of a square and at each of the four corners. They will adjust the distance between boreholes if there is variation in a certain area. Near the former river bed, for example, the distance between drill holes can be reduced to 25 meters. GIA has not seen much of the auger drilling technique being used before for alluvial colored gemstone mines. The drill bits and other equipment are hauled by truck to drilling sites. Every exploration team is composed of a geologist, a technician, and four or five workers. 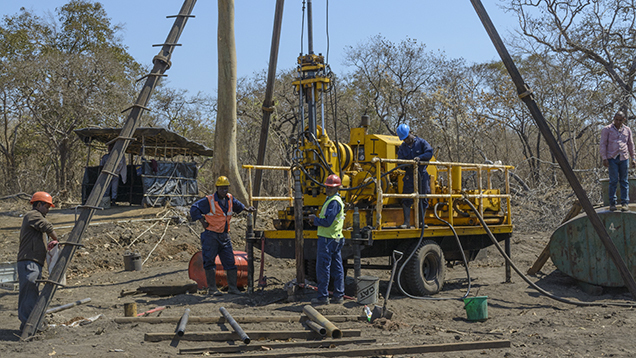 From setting up the machine to refilling the borehole, it takes about an hour to finish one spot. The goal is to finish eight to nine drill holes each day. The sites are already cleaned and prepared before the drilling starts. From ground level, the drill will remove one meter of earth with every sampling until it hits the basement rock. Then the drill will keep removing 2–3 meters of basement rock before it stops. 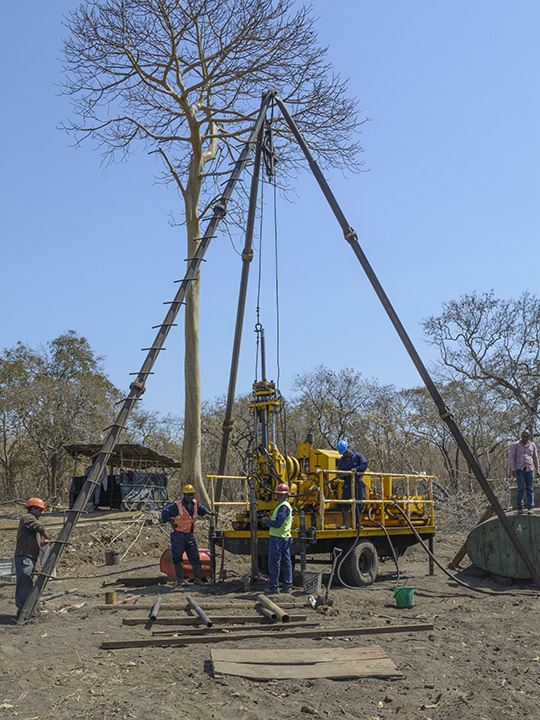 The average depth of the drill holes is about 8 meters, and each day the team needs to finish about 70–80 meters of drilling. MRM runs two shifts per day. 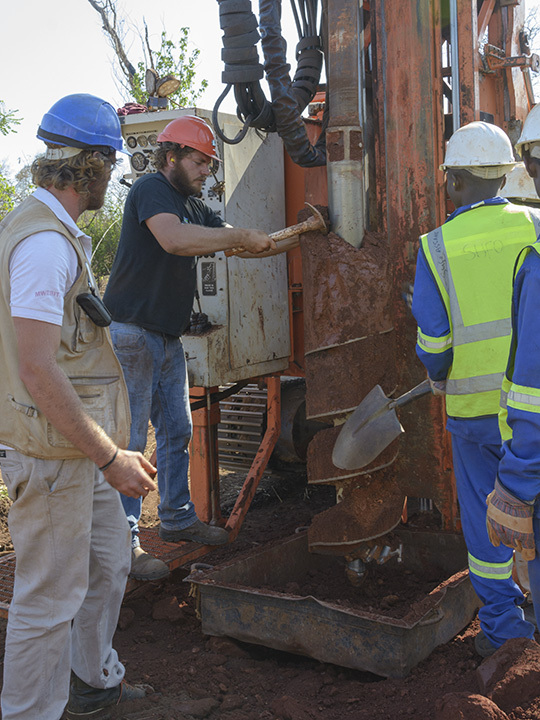 The drilling results will indicate the depth and thickness of the ruby-bearing gravel layer at each location. After thousands of drillings are done, a contour map will be constructed to show the depth and thickness of the gravel bed in the whole area. 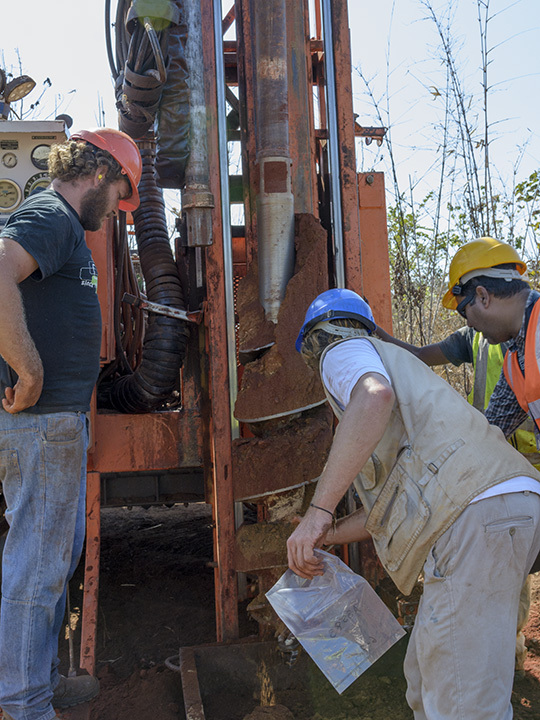 Prior to our visit, auger drilling had already helped delineate a continuous paleochannel 2.5 km long, as well as many other sites with strong potential. 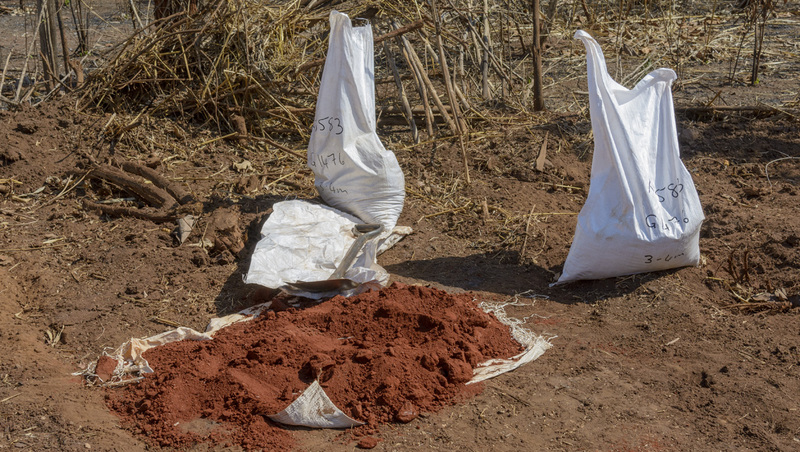 Sampling the topsoil also gives the geologists a good idea how much waste they will need to remove before reaching the ore-containing gravel layer. To get a representative sample, each meter of earth removed from the drill bit above the ruby-bearing gravel layer is thoroughly mixed by a method called coning and quartering. For every meter, the geologists take 50–100 grams of sample for geochemical analysis to quantify certain elements that will guide further exploration and evaluation. 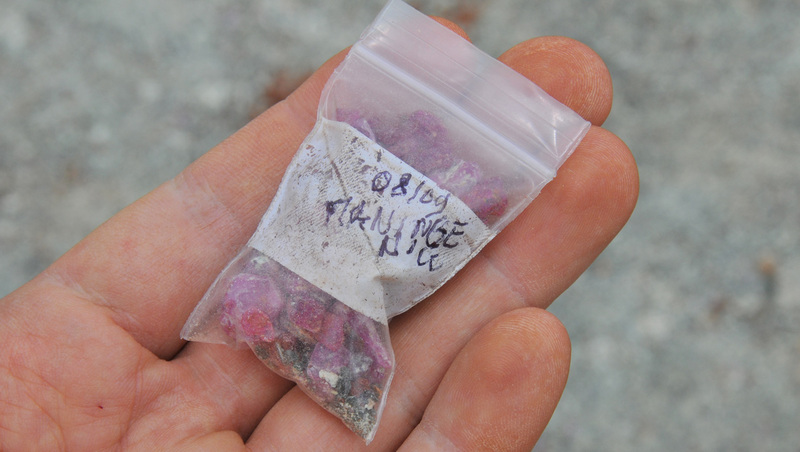 When the drill hits the gravel layer, 10–20 kilograms of the ruby-bearing gravel are bagged and transported back to the washing plant and the sorting house for processing in order to get a rough estimation of the ruby concentration. The top 1–2 meters of the basement rock are also washed to minimize the risk of losing rubies. The leftovers from all samples are carefully stored for future reference. 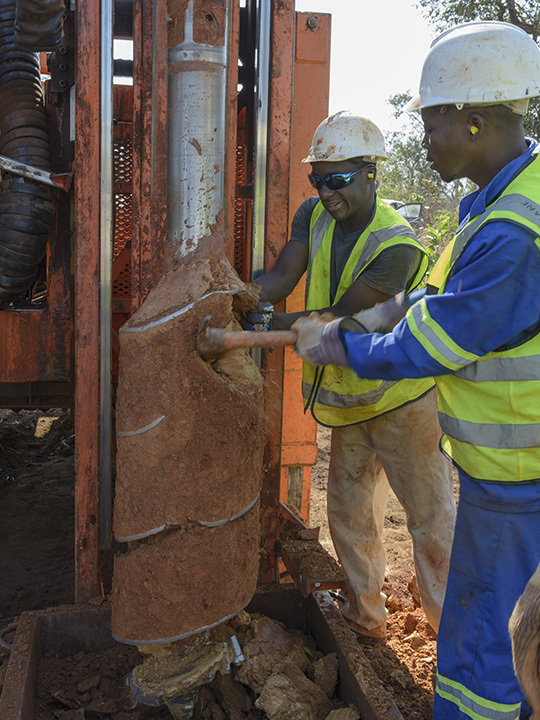 The process is completed by refilling the drill hole in an environmentally responsible manner. Ultimately, understanding the geology of the primary deposit is the key to sustaining a profitable mine. Following the ruby formation model, geologists must locate the host rock with geophysical tools. In this case, the target is the related amphibolite and the magmatic intrusions. Different mineral assemblages in rocks give off different magnetic signatures that can be displayed by a detailed magnetic scan. The results are used to model the distribution of certain rock types. Amphibolite usually gives a high magnetic anomaly that is easily distinguished from other rocks in this area. A high-resolution magnetic survey helps the geologist form a map pinpointing the location of the amphibolite. Next, a radiometric survey on uranium, thorium, and potassium is applied to detect the alkaline magmatic intrusions in the area. Further exploration plans are based on these results. Exploration of the primary deposit is done by extensive core drilling around the currently exposed Maninge Nice area, and the goal is to better define the 3-D distribution of the ruby-bearing amphibolite below the surface. 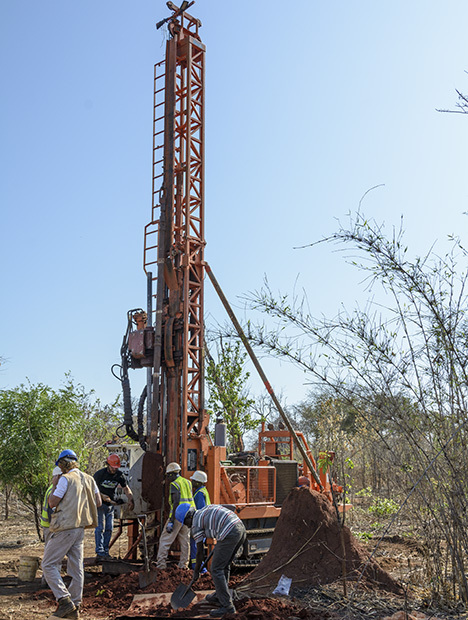 Each drilling extends about 50 meters deep and takes one week to finish at an average of 10 meters in depth per day. Drill bits coated with synthetic diamond are used to sample the rock every meter, a depth dictated by the length of the bits. 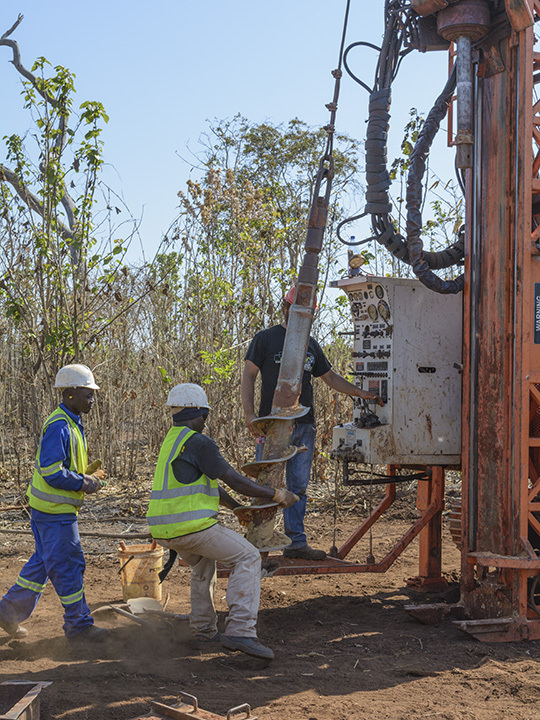 Following a similar strategy to the one at the secondary deposit, the exploration team positions drill sites every 100 meters. When more lithological variation is observed, the distance is shortened to 50 meters. Through extensive core drilling, the geologists have made some crucial discoveries underground. The ruby-bearing amphibolite is usually found at a depth of 10 to 30 meters. Each core starts with the topsoil, which is bagged because it is loose. 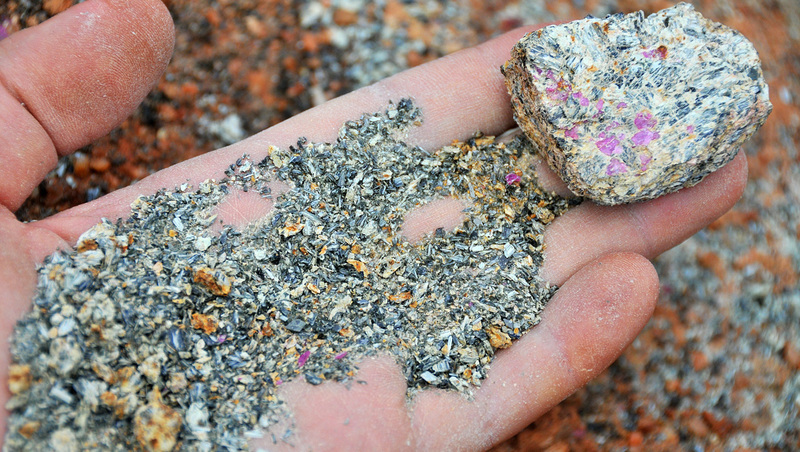 Sometimes, a secondary ruby-bearing gravel bed is found above the primary deposit. The amphibolite with ruby can extend to 30 meters deep, and then it gradually changes to granitic gneiss, the basement rock in the area. They drill down the basement rock as well to see if the amphibolite repeats. In addition to the amphibolite, they have defined two marble bodies to the north of Maninge Nice. No rubies were found in the marbles, though. 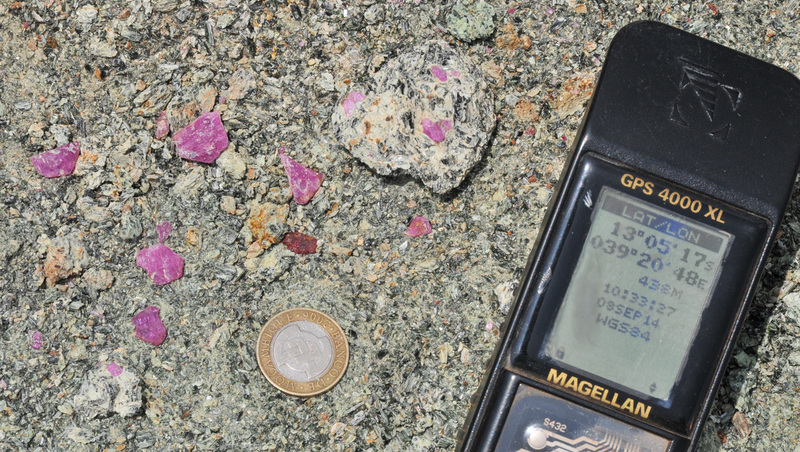 Various concentrations of rubies were found in the amphibolite. A detailed report on the primary deposit will be submitted to the company in 2016. Thus far, as part of its bulk-sampling operation, MRM has handled around 1.8 million tons of rock at Montepuez, recovering approximately 8 million carats of ruby and sapphire of various colors. The company hopes to double their capacity to 3.6 million tons of rock in 2015 and eventually increase that figure to 10 million tons of rock a year. The actual recovery of ruby is more difficult to predict. The amount of ruby per ton can vary greatly in the gem-bearing gravels of the secondary deposits. 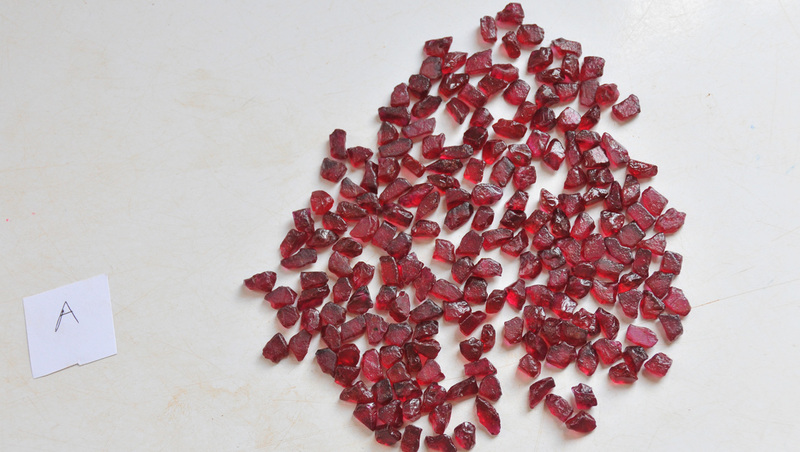 The quality of the rubies recovered can also vary greatly. Again, using Mugloto pit 3 as an example, the recovery rate is relatively low: 0.60 grams to 1 gram per ton of ore processed. 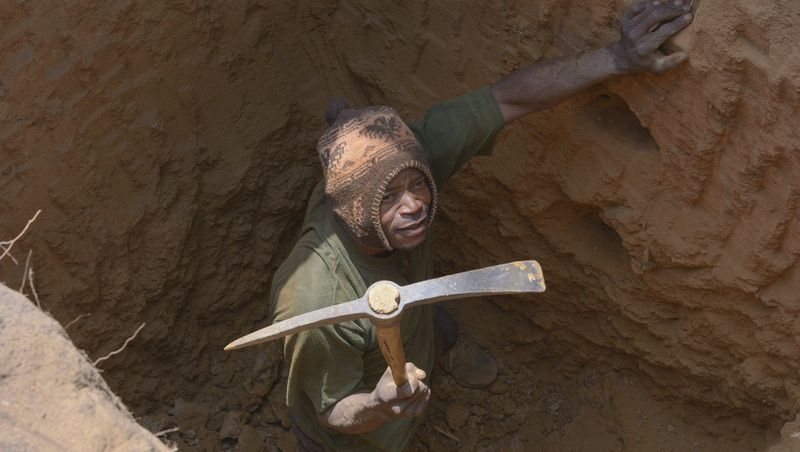 Yet pit 3 yields high-quality ruby, making it economically advantageous to mine, even with the low recovery rate. This pit also produces some large rough crystals of six to eight grams. Compare this to Maninge Nice, which has a higher recovery rate of 20 to 35 grams per ton but produces much lower-value material overall. Overall, the recovery rate for the primary deposit is around 162 carats per ton, while the secondary deposits bring 31 carats per ton. 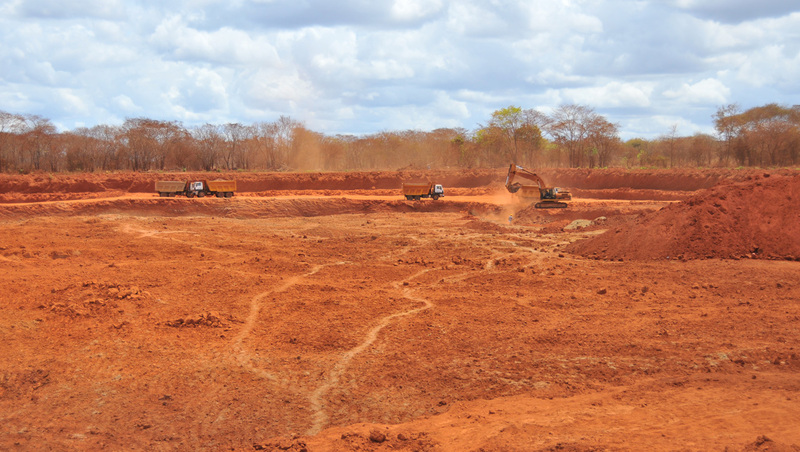 The figure for the secondary deposits only includes gravels processed and not the overburden topsoil moved. The Montepuez processing plant was recently expanded to reach a capacity of 150 tons per hour, and there are plans to increase that by an additional 250 tons per hour. The processing plant is organized into four major areas: (1) dry screening, (2) disintegration with a log washer, where the removal of waste particles with water begins, (3) wet screening, and (4) sizing and concentration. In an auxiliary section, water is held in a reservoir and cleaned for use in washing. In a systematic process, the MRM washing plant uses screens to separate the material by size, then finally traps the ruby in jigs. Photo by Vincent Pardieu/GIA. The washing process uses two screening systems and two jig systems, both of which separate the material by size. The jigs have a batch system where any overflow from the first upper-level jig is retrieved by the lower-level jig. The 150 tons washed per hour deliver concentrated gravel containing variable amounts of corundum rough. During our visits, we were twice able to see the jigs opened. While opening a jig and seeing gemstones in the gravels is always exhilarating, the experience at MRM was beyond compare. Once the jigs were opened, a suction hose pulled the gravels into a canister. Then the gravels were poured into bags and taken to the sorting house. One amazing sight was watching the suction hose remove the gravels in each section of the jig as it worked its way toward the bottom. As the suction hose pulled out gravel, we saw more and more red. When the gravel was nearly gone, the jig was almost completely red as the ruby’s higher specific gravity caused it to concentrate at the bottom. We had never seen such a concentration of gemstones in a jig. 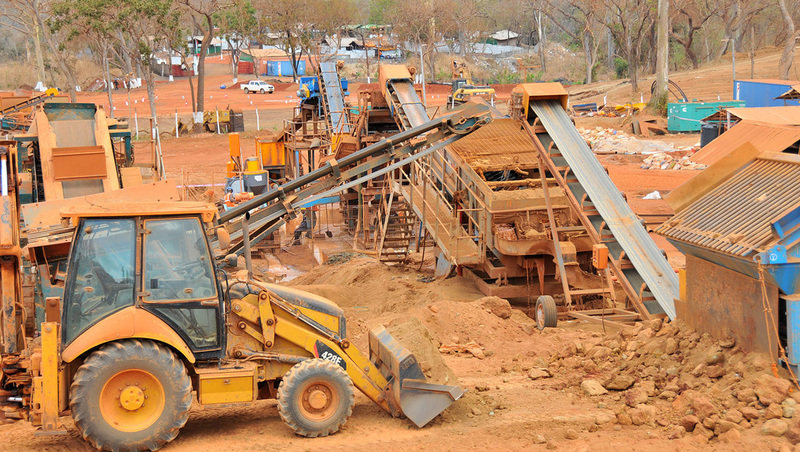 The washed gravels are taken from the processing plant to the sorting house. The concentrated gem gravels are loaded into the back portion of a sorting box, a rectangular case with an angled glass window for viewing. This is the first step in separating ruby from the gravels and garnets. The sorters never actually touch the rubies. They put their hands in sleeves with rubber gloves at the ends. This helps reduce the possibility of theft. The stones retrieved are dropped into two holes, one for garnets and the other for corundum. The sorters make the identification based on visual appearance, especially crystal morphology. The rubies are separated from the gravels and dropped into the ruby hole. In the sorting house, ruby, sapphire, and garnets are separated from the gravels. 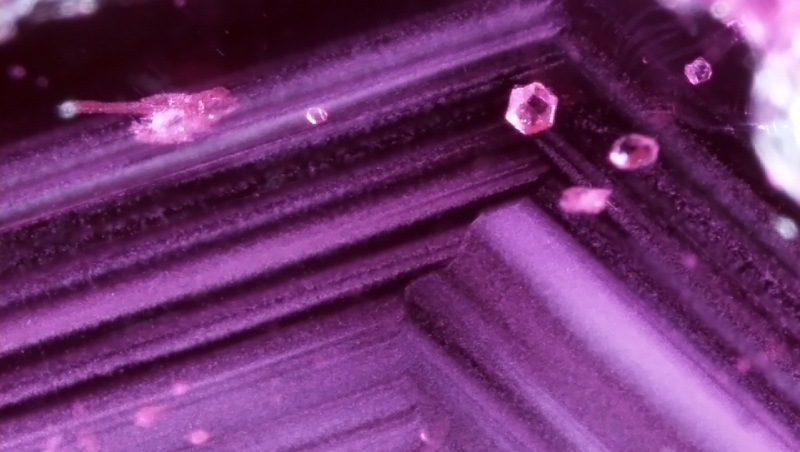 In the third step, a senior staff member and a member of the security team unlock the portion of the box where the gemstones have been dropped. 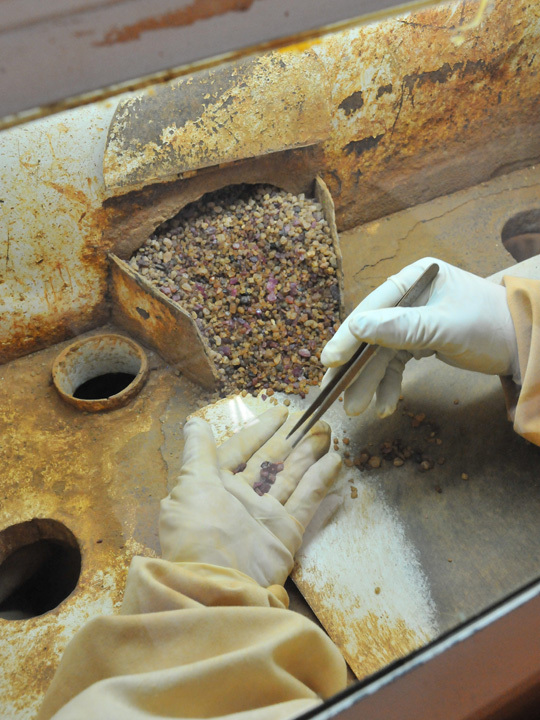 The corundum crystals are cleaned and sorted into classifications. 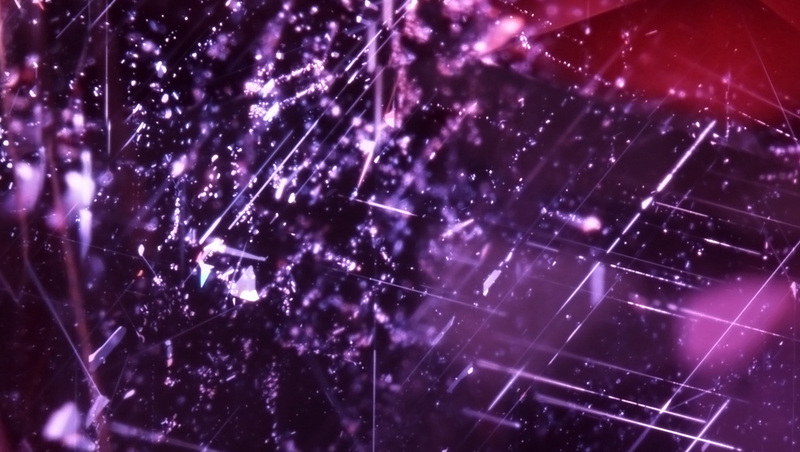 First, the rough is divided into dark and light tones, representing ruby and pink sapphire, respectively. The rubies are classified into four further categories: premium, facet-grade, translucent to opaque material, and just corundum. The premium and facet-grade stones are graded for clarity, color, and carat size. The grading of the premium ruby rough was done in an adjacent room with ample daylight. We watched as the rubies were graded by color and then clarity. The color grading was done in daylight from the windows just in front of the graders. The background was a white table. The graders examined the stones on or just above the table and also held them up to the daylight. Two young Burmese graders from Mogok were grading the clarity. We spoke with them, and both were excited about this deposit and the chance to see so much ruby rough in a wide range of qualities. The Gemfields ruby grading system was developed by a team led by MRM’s Philippe Ressigeac, a gemologist who graduated from GIA Thailand in 2009. The system is based on the rough’s size, color, shape, and clarity. 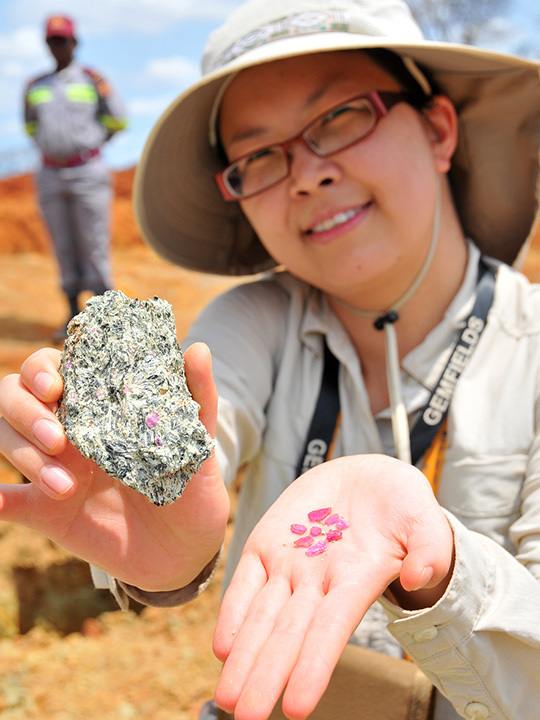 GIA’s Bangkok lab has been collecting reference samples and mining information since 2008. The team’s current main focus is to collect and study ruby, sapphire, and emerald reference samples based on GIA’s protocols. 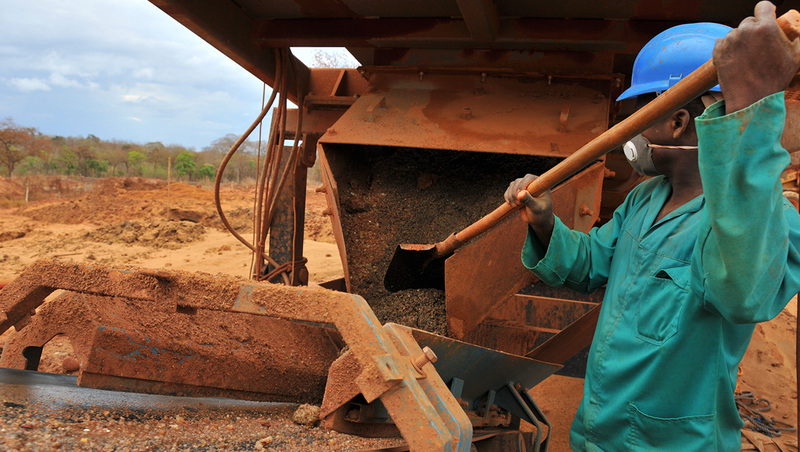 In 2009 and 2012, teams led by author VP traveled to African mining sites before they were even in production. Reference samples were collected from the sites and from some West African dealers in Mozambique as well as Thai merchants based in Bangkok or Chanthaburi, Thailand. 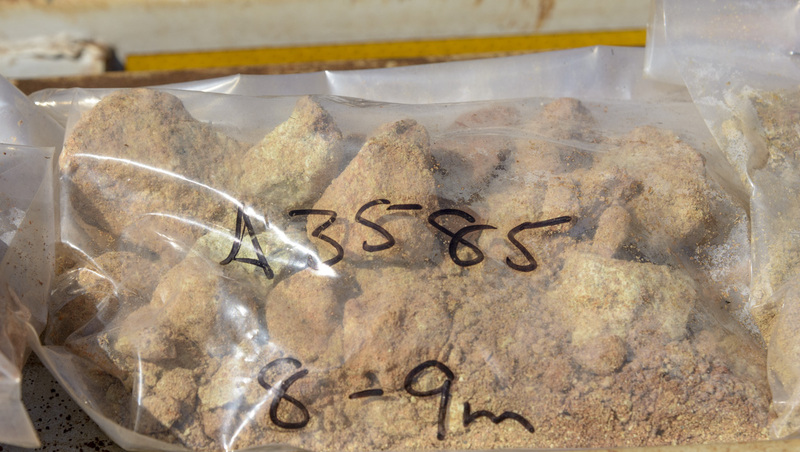 During the September 2014 expedition, samples were collected from the Mugloto and Maninge Nice pits. 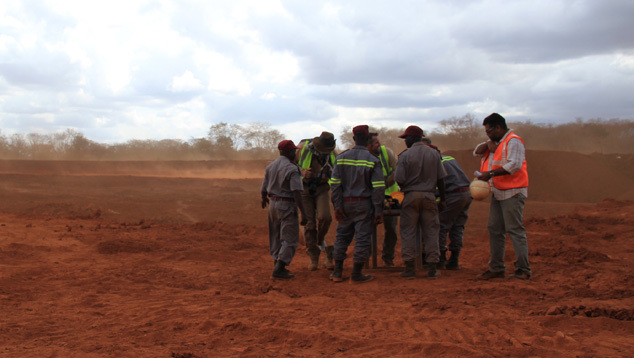 At Maninge Nice, the GIA team was allowed to search the ground under the supervision of company security guards. The host amphibolite was highly weathered, making it very easy to extract the rubies from the host rock. Vincent and his team removed the samples from the host rock with rock hammers. They collected a fair number of high-quality samples that met the requirements for lab preparation and analysis. These valuable reference samples, collected onsite, will be important additions to the GIA reference sample database. They are especially valuable because they are type A samples. This means they were mined directly from the rock by the gemologists themselves. At the time of our 2012 visit, MRM was only processing gem-rich ground from Maninge Nice. 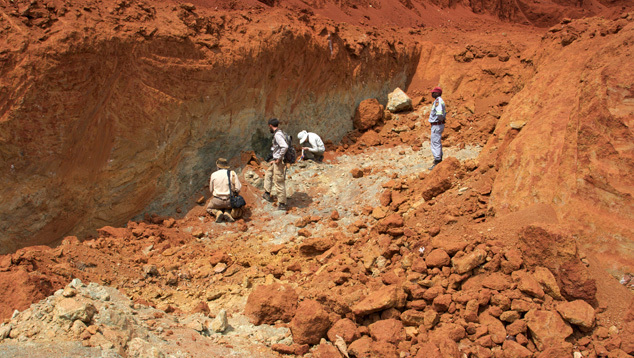 As a result, we could not find samples at the Mugloto pit. 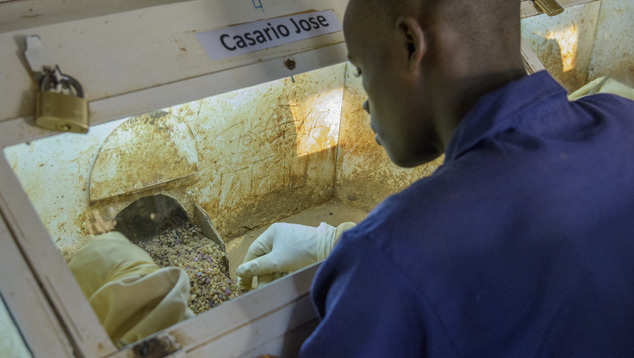 Some samples from that area’s production from the previous month were selected at the Gemfields sorting house. The samples were collected at the mine, by the miners. Since GIA did not witness the actual recovery, the samples will be classified as C type samples. 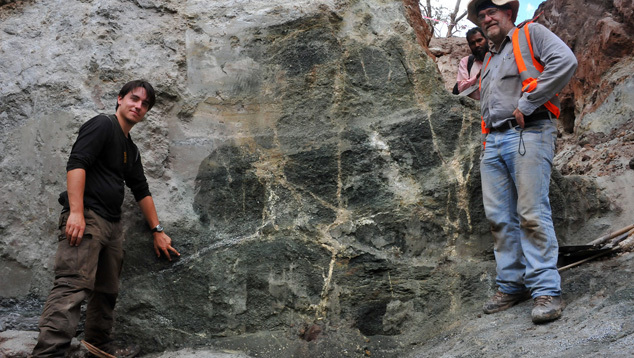 On September 10, 2014, author VP and expedition guest Stanislas Detroyat accompanied the Gemfields geologist to the Nacaca area outside of the company’s concession. They documented mining activities and collected onsite reference samples from several garimpeiros, either at their washing area or at their camp. 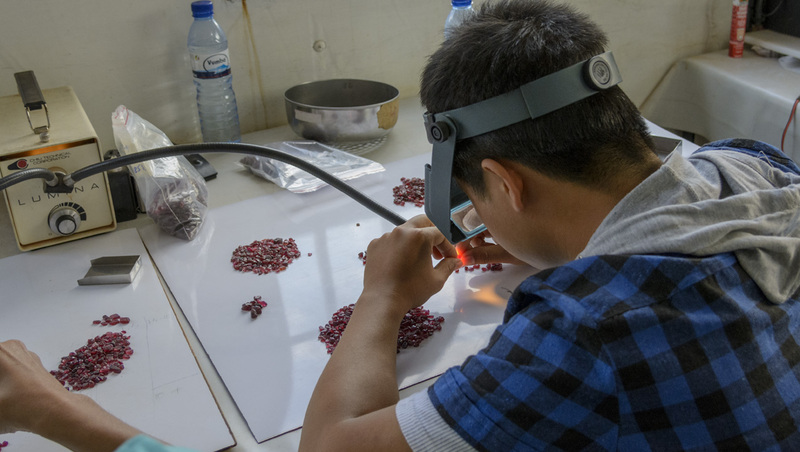 All samples gathered from this trip will be shipped by Gemfields to GIA’s Bangkok lab for analysis and a forthcoming research paper on country-of-origin determination. Note: For more details about GIA sample classification, see Annex A here. Rubies from Montepuez are very important to the trade because of the large quantities and the wide range of qualities and sizes produced. Their colors bridge the gap between those from the classic sources of Burma (highly fluorescent, with low iron content) and Thailand/Cambodia (weakly fluorescent, with high iron content). While rubies owe their red color to chromium, their color is modified by the presence of iron, which reduces the chromium-caused fluorescence. An interesting aspect of rubies from the amphibole-related deposit near Montepuez is their range of iron content, from nearly as low as Burmese marble-type rubies to as high as rubies found in basalt-related deposits along the Thai-Cambodian border. This means they can potentially suit the tastes of a range of different markets. Regarding quality, a small but significant percentage of the material has a combination of color and clarity that requires no heat treatment. But most of the rubies lack transparency due to fissures or the presence of inclusions. Heat treatment transforms this lower-quality material so it can find a market within the jewelry industry. Lead-glass filling is used for heavily fractured stones, while more traditional heat treatment (with or without borax-like additives) is performed on less-fractured stones with a milky or silky appearance. Overall, treated products are much more readily available than unheated. All these rubies from the Maninge Nice area have sharp edges and corners. The surfaces of some still feature amphibolite matrix. Their brighter color is caused by the limited amount of iron content compared to rubies from other areas. Photo by Vincent Pardieu/GIA. 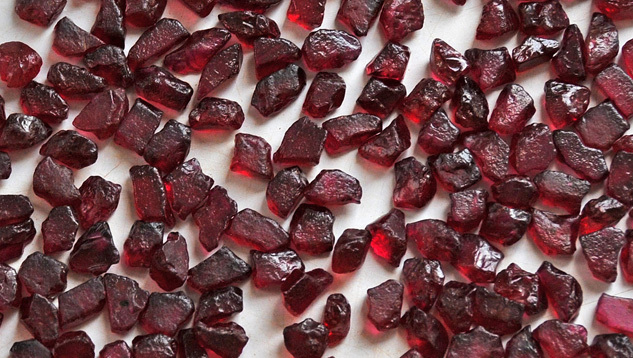 Montepuez rubies come from several different bulk sampling areas, each yielding a slightly different appearance. The material from Maninge Nice looks purplish red to red. Rough rubies from the Ntorro area tend to be darker and more brownish or orange. Thai dealers call this material “Bo Som,” which means “orange mine” in Thai. A study done by GIA’s Bangkok lab found that Ntorro material generally has higher iron content than samples from Maninge Nice. The study also showed that Ntorro rubies can be very similar in iron content to Thai/Cambodia rubies. 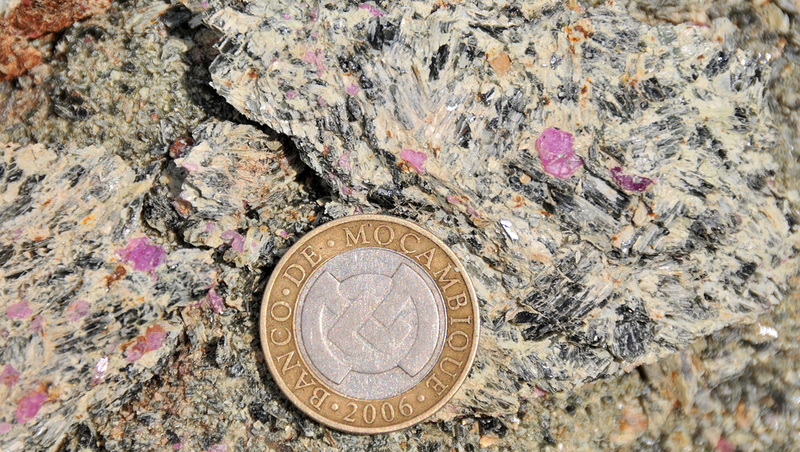 These classic secondary deposit rubies are from the Mugloto area, Montepuez. Most of them are tumbled and clean from millions of years of weathering by the river that transported them. The darker color of these stones is caused by their relatively higher iron content. Photo by Vincent Pardieu/GIA. Montepuez rough rubies are mostly tabular. Specimens from the primary deposit are usually more euhedral, but also more fractured, and contain amphibole and mica inclusions. The rough from the secondary deposit is generally more tumbled, but also more transparent and less included. While there are some exceptionally large stones over 100 carats, most of the unheated faceted rubies from Montepuez are under 3 carats. Faceted stones over 10 carats were found at the Bangkok and Hong Kong shows in September 2013. With their even coloration, high transparency, and good luster, unheated rubies from Montepuez are very suitable for calibrated cuts. 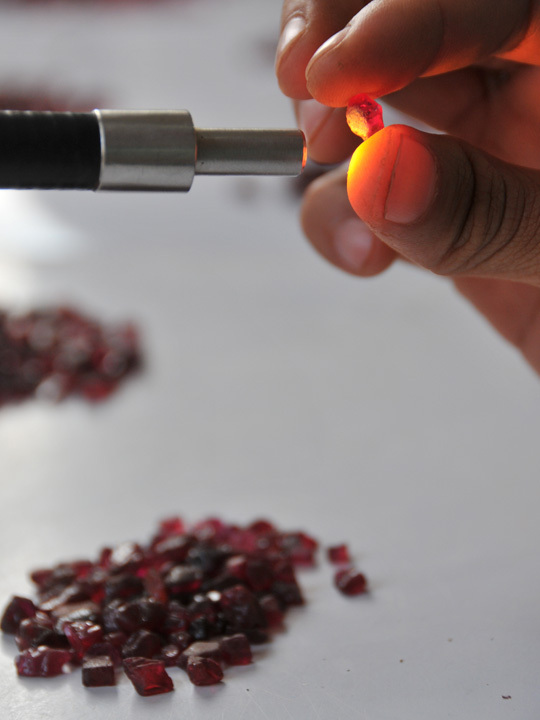 A study on the gemological characteristics of the 131 ruby samples from Mozambique was completed by GIA’s Bangkok laboratory and published in 2013. Studies of inclusions and chemical composition are in progress, and the results will be presented in future articles. Gemfields is a publicly traded company listed on the London Stock Exchange. Their goal is to be the world’s largest supplier of colored gemstones. They boast a tremendous amount of geological and colored stone mining expertise, along with proven grading and market strategies. 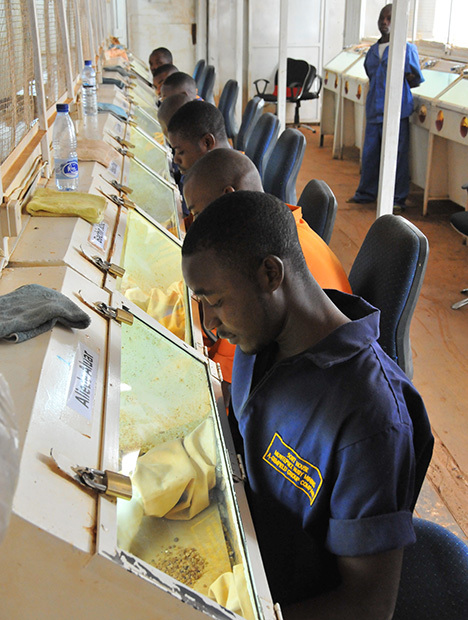 Through its Kagem emerald mine in Zambia, Gemfields already has a history of successful emerald auctions. They also have experience in forming mining partnerships with governments and local communities and the capital to bring in any needed expertise and resources. 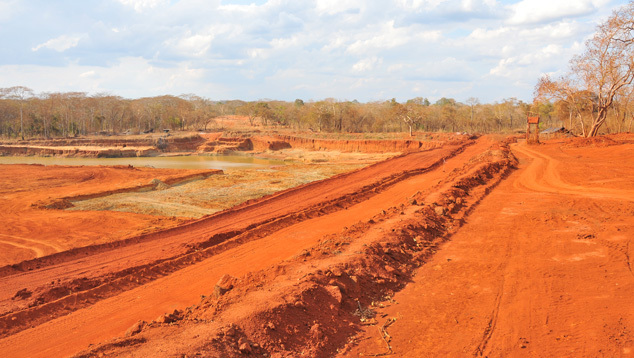 The Kagem emerald mine is a project of Gemfields in Zambia. This is a view of the mining activity inside that mine’s Chama pit. Photo by Vincent Pardieu/GIA. 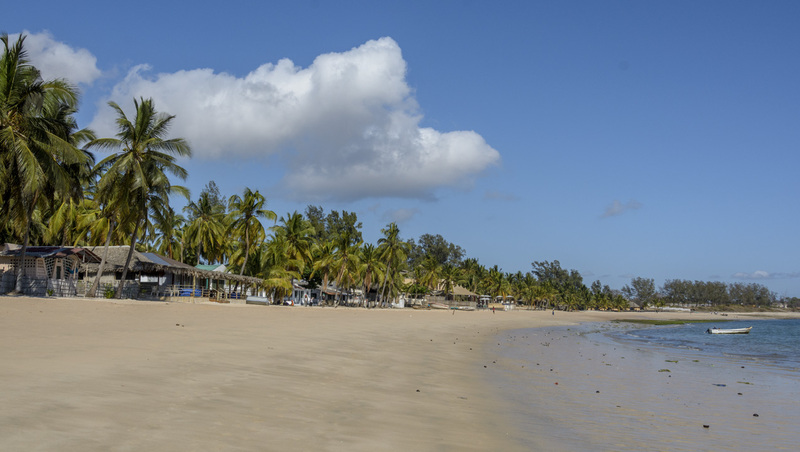 Mwiriti, a Mozambique company based in Pemba, is involved in a number of industries, including tourism, transport, and hunting concessions. 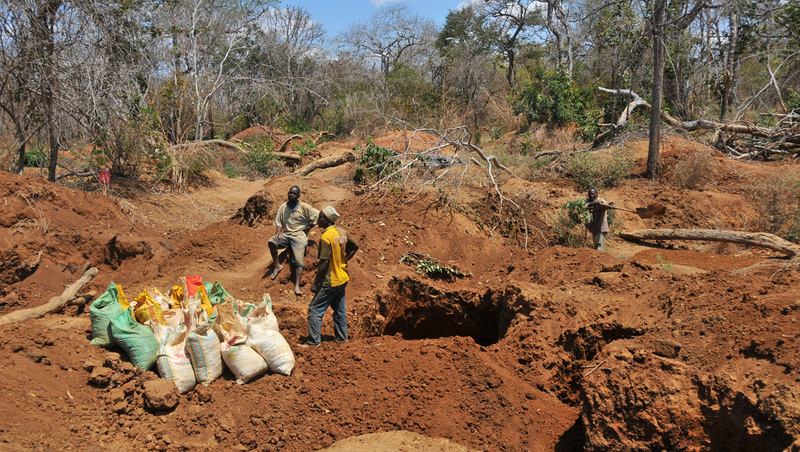 The current MRM ruby bulk sampling concession was originally discovered on one of the Mwiriti hunting concessions. 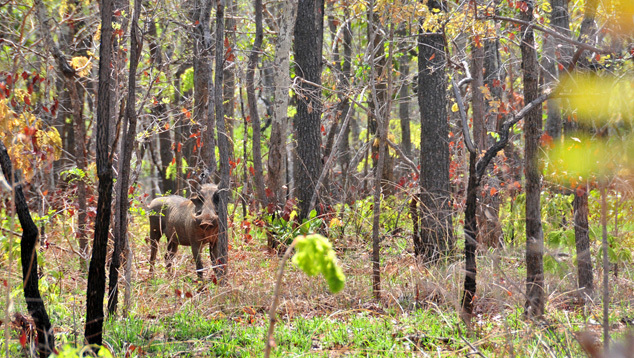 This warthog was spotted in a forested area in Northern Mozambique. These wild pigs are a favorite prey of lions. Photo by Vincent Pardieu/GIA. 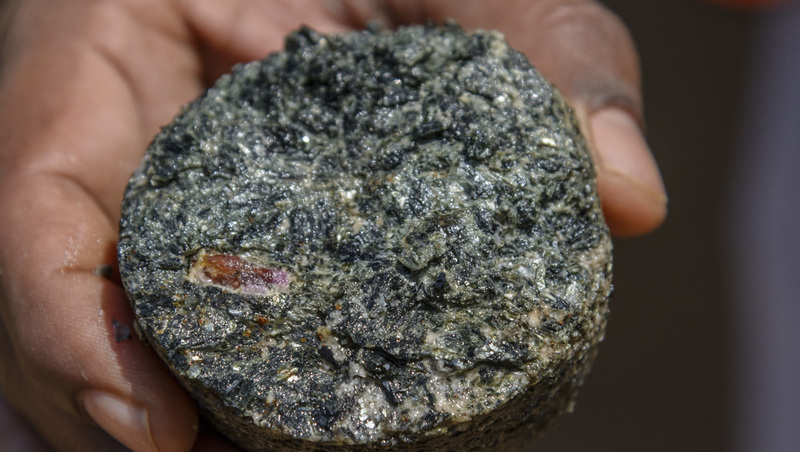 Mwiriti acquired a prospecting license to explore the ruby deposit. 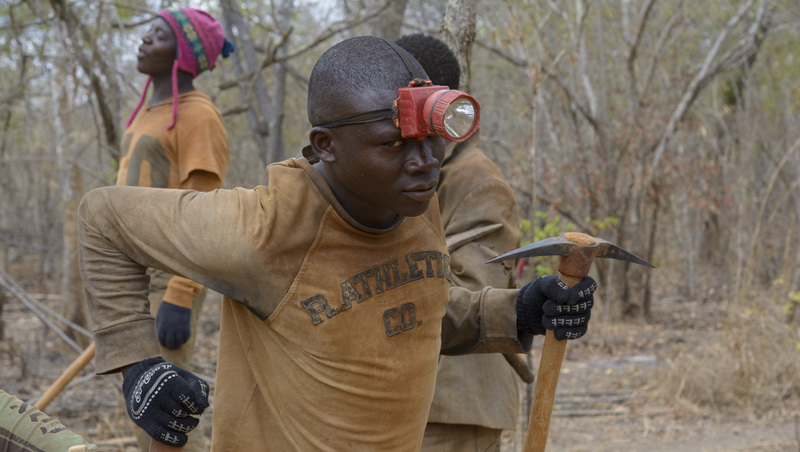 At the time, unlicensed miners were doing all the digging. 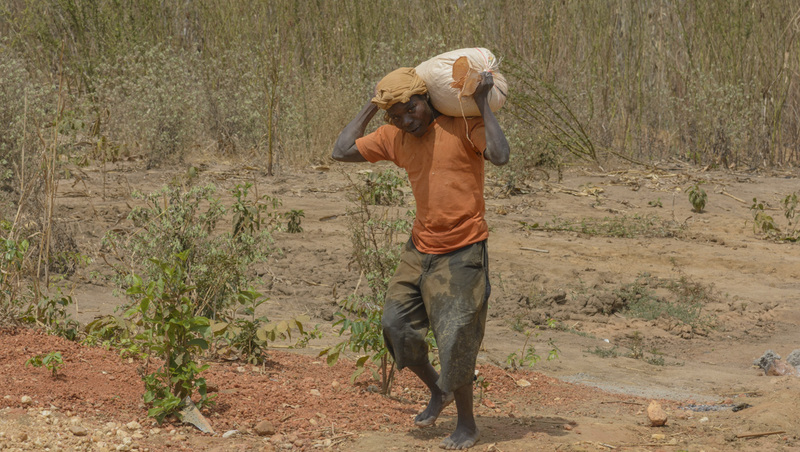 As Mwiriti lacked experience in ruby mining, it was difficult for them to control the property. 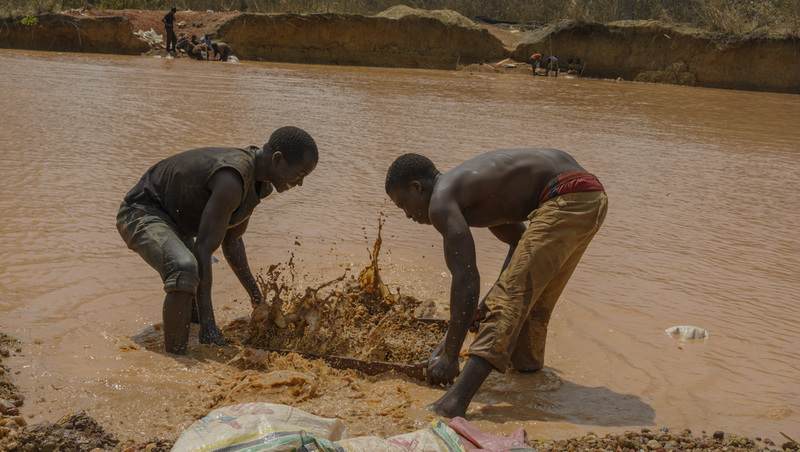 Several companies involved in colored gemstone mining approached them about creating a partnership in the project. After some discussions, Mwiriti decided to partner with Gemfields. 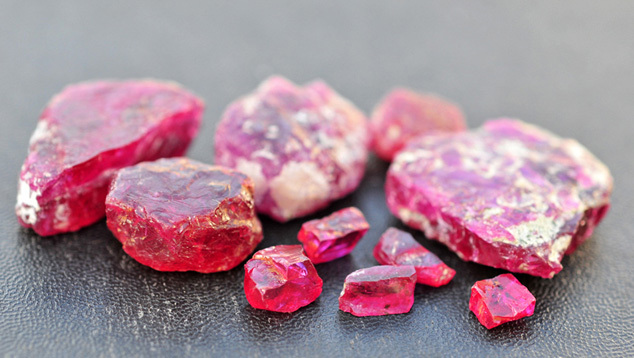 The Montepuez Ruby Mining Company is the corporation formed by Mwiriti and Gemfields. Gemfields has a 75% interest, Mwiriti 25%. MRM was formed in June 2011 with a joint venture agreement, and in November 2011 the corporation acquired a 25-year concession. The company actually has two concessions. MRM’s goal is to be one of the leading ruby suppliers in the world. 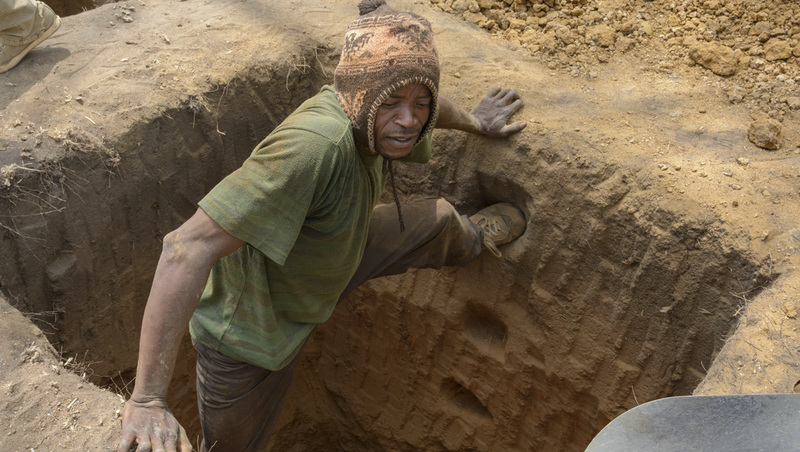 Acting as a local company, Mwiriti is responsible for creating the right business environment and guiding Gemfields in its dealings with the national and local governments and community leaders. Business issues include taxes, equipment imports, gemstone exports, and social programs for local communities. Mwiriti had experience with the same matters through its hunting concessions. 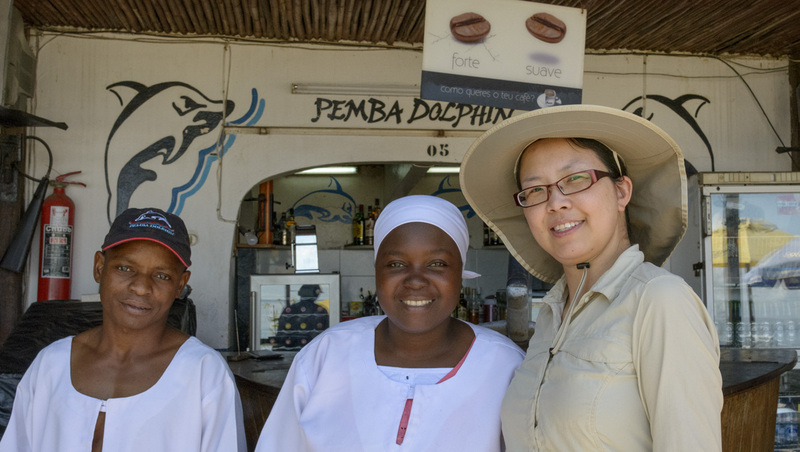 They speak the language and know the locals, which was highly valuable in moving this project forward. Mwiriti was able to talk to the community leaders and find out what they needed. 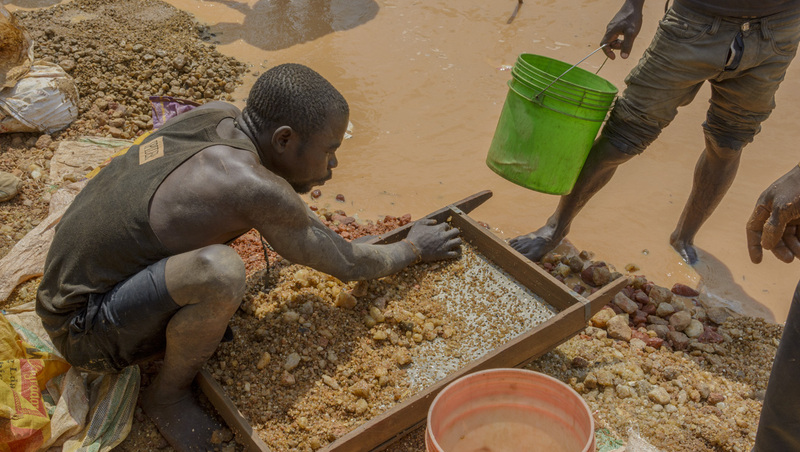 Since export of gemstones was not an area that tax authorities in Mozambique had a great deal of experience with, Mwiriti was able to help Gemfields communicate with tax and export authorities to work out mutually beneficial arrangements. 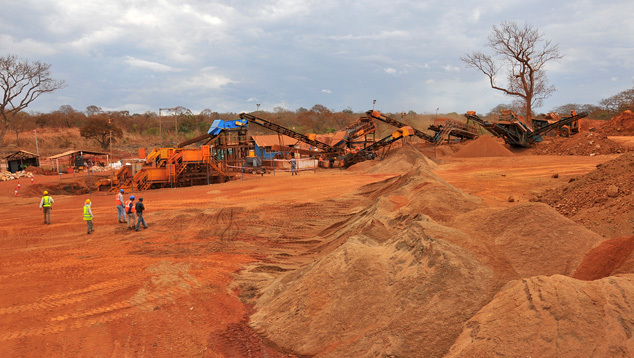 Much of the equipment MRM imports into Mozambique is new to the country and specialized for colored stone mining. Getting the equipment into the country in a timely fashion has involved learning how to deal with customs and import duties. 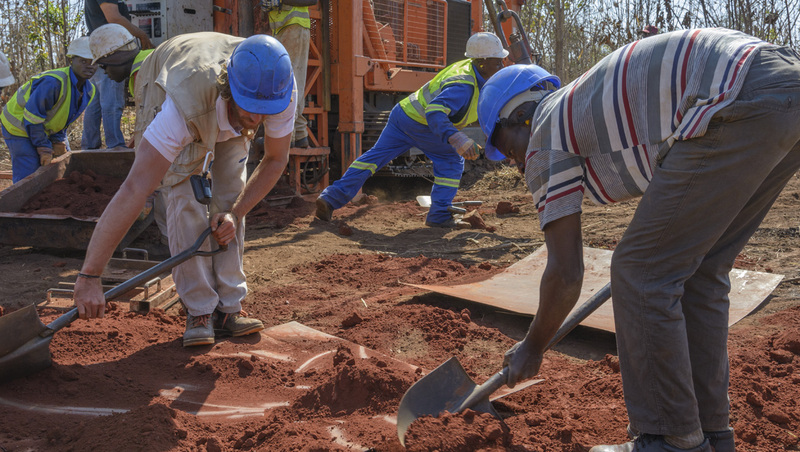 Equipment also constantly requires maintenance, parts, and replacement, so a working relationship with Mozambique import officials is critical. MRM employs about 400 people at the mine, plus another 300 contractors. Some of these personnel are expats who specialize in geology, mining, security, and grading. The expat team works as a cohesive unit, and the general manager attributes much of the mine’s rapid success to this philosophy. The company also trains the Mozambican employees, who make up the vast majority of the workforce, to attain high skill levels. 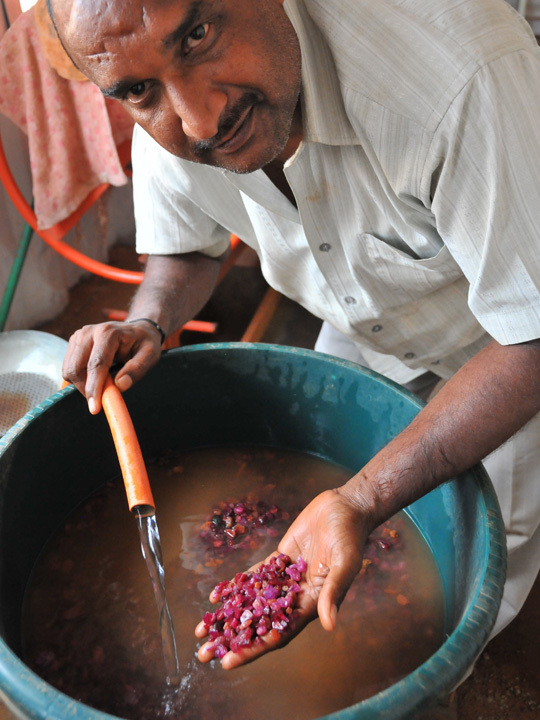 Most of the employees at MRM are from local villages. MRM provides them with transportation. Photo by Andrew Lucas/GIA. 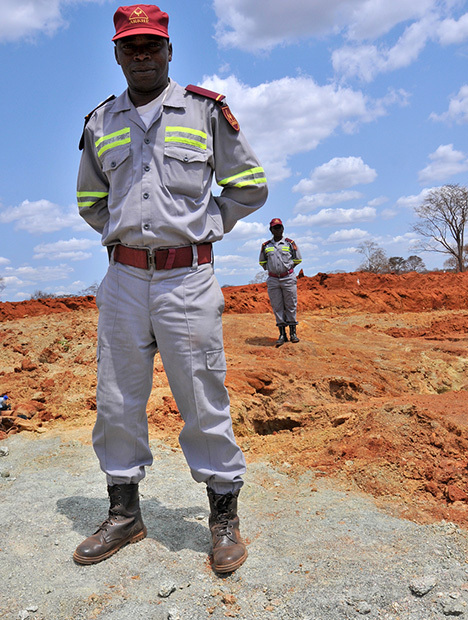 Mohun Raman is the head of security at the Montepuez ruby mine. He told us that internal security procedures, including checkpoints and searches, have greatly deterred theft at the bulk sampling, processing, and sorting areas. However, external security concerns remain one of the biggest challenges the company faces today. We passed through security checks before we were able to enter the concession. 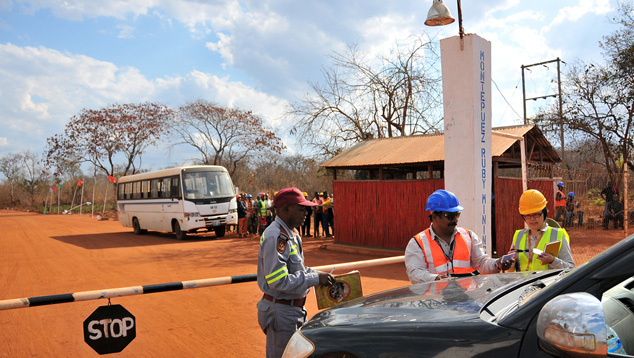 On the other side of the barrier, a group of MRM miners leaving the mine were going through their daily routine security check. Photo by Vincent Pardieu/GIA. 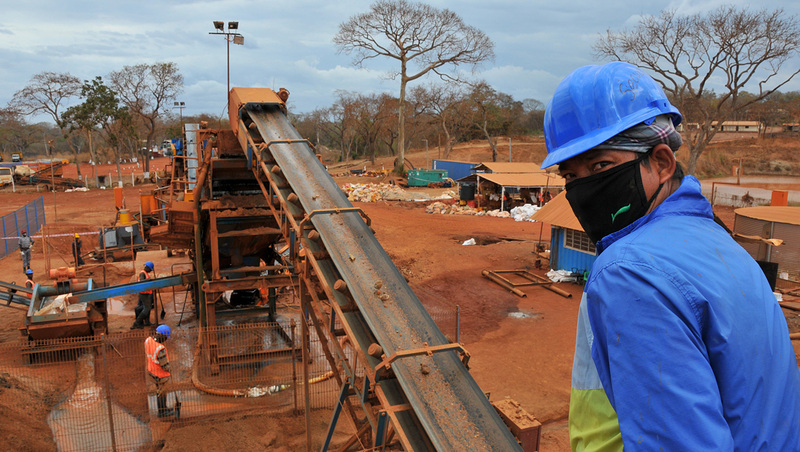 Groups of unlicensed miners, called garimpeiros, are present all over the MRM property. They are supported by an extensive network of foreigners who fund them and provide the market for the stones they find. These unlicensed miners carry on a cat-and-mouse game with MRM security. They boldly dig pits and mine the gravels on MRM property, often right by the side of the road. 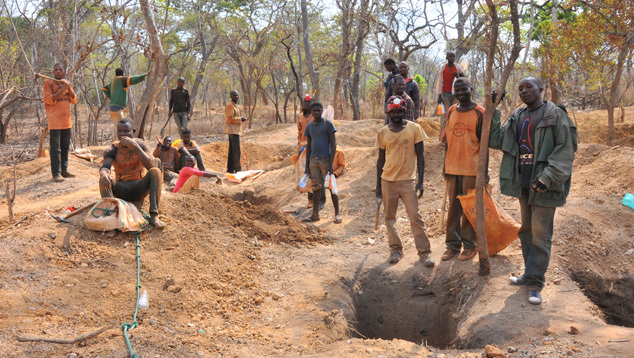 At any given garimpeiro site, dozens of miners work several small shallow pits, a common sight at colored gemstone alluvial deposits in Africa. They also organize washing sites by the side of the river. 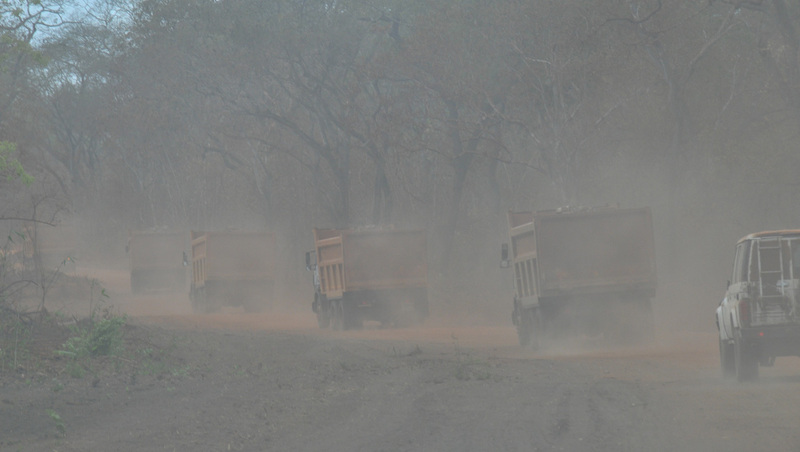 Once MRM security spots a garimpeiro operation, they send a team to drive the miners away, following established security procedures. MRM security members do not carry weapons, fire warning shots, or use force, but they are accompanied by armed Mozambican police officers who will intervene if there is a confrontation, which is rare. After the miners vacate the area, MRM uses bulldozers or backhoes to fill the pits. This must be done with great care and carefully documented so as not to inadvertently bury miners hiding in tunnels. MRM security members, local police, and the bulldozer or backhoe operator must all sign off that they have inspected the pits before filling them. The MRM security team and armed policemen chase the garimpeiros away during a security operation. Photo by Vincent Pardieu/GIA. Amazingly, the garimpeiros often watch from a short distance away, waiting to return as soon as the security team leaves. 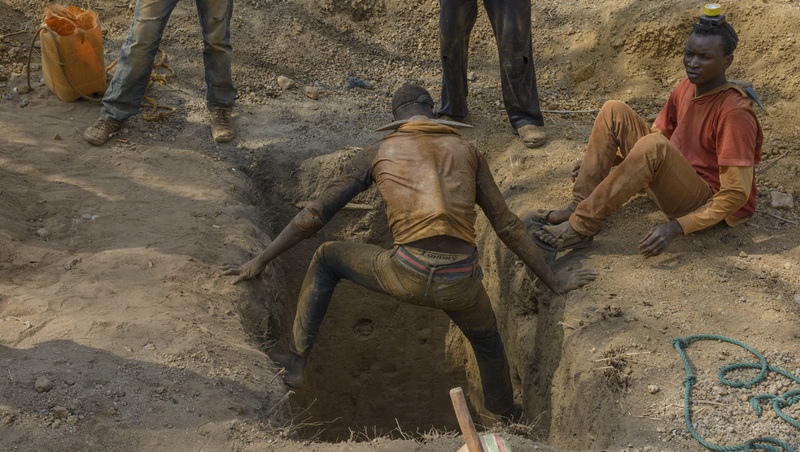 This is partly because independent miners are considered “unlicensed” rather than “illegal.” If MRM security were to detain these miners and turn them over to the authorities, they would be released more or less immediately. 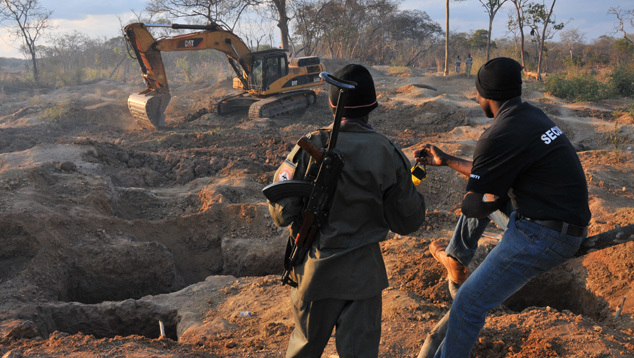 After the security operation, a MRM security guard and an armed policeman watch as an excavator closes the pits dug by garimpeiros. Photo by Vincent Pardieu/GIA. The situation in September 2014 was much quieter than it was in 2012. During that earlier visit, the team witnessed a major police operation that expelled several thousand illicit miners from the Ntorro area. 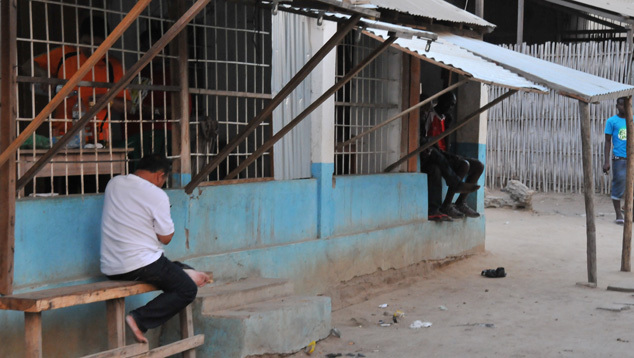 Before the operation, the situation between MRM and the garimpeiros had become tense, as security personnel were having a very hard time taking control of the Central and Maninge Nice areas, where camps had been set up from 2011 to the beginning of 2012. MRM’s control of that area became effective only when the garimpeiros moved to Ntorro in June 2012. Even though things were quiet in September 2014, Mr. Raman nonetheless considered it a tense situation. MRM security actually consists of three organizations: MRM’s own security staff, composed of thirteen expats and about 125 local employees; a private security agency, ARKHE, that has an onsite expat security manager and around 250 guards; and a uniformed and armed government police force, the FIR, with about 30 men. staff leave the mine facilities. Photo by Vincent Pardieu/GIA. 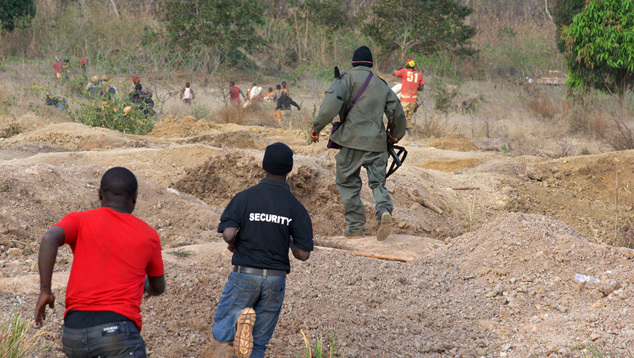 With roughly 400 square kilometers to cover, the security forces concentrate on the existing and anticipated mining areas. The core of current bulk sampling is a four kilometer by four kilometer area, and Mr. Raman feels that this site is reasonably secure, with only sporadic and limited activity by the garimpeiros. 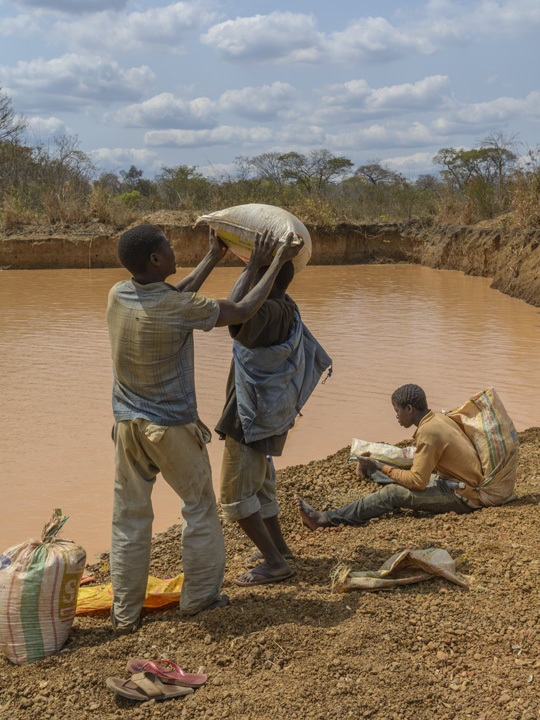 In a more recently opened MRM area, the Mugloto sector, unlicensed mining is more intense. 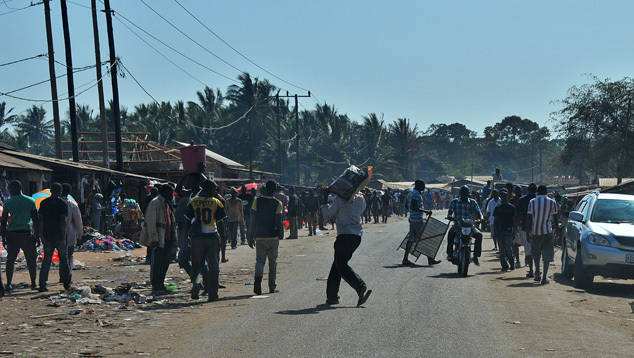 Inside the MRM concession are two villages, Namutcho and Namahumbire. 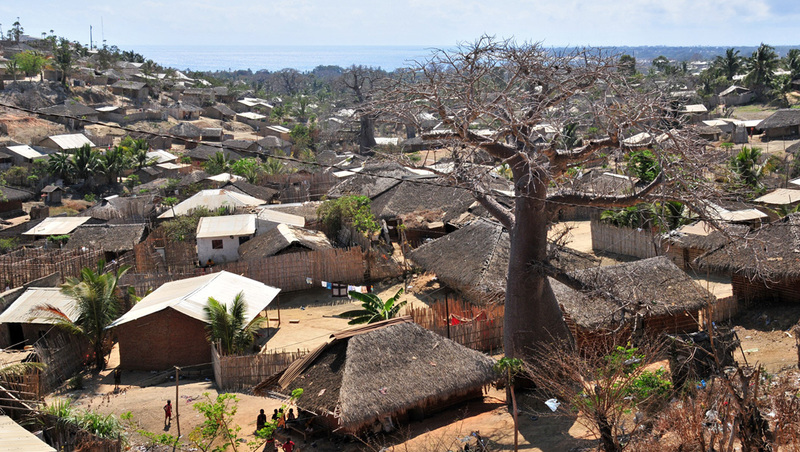 These villages, as well as Nanhupiu, which lies just outside the concession on the road to Pemba, offer logistical support for the unlicensed miners: restaurants, blacksmiths, shops, and mining tools such as torch lights and picks. The residents of Namutcho and other villages near Ntorro and Mugloto were supposedly being relocated and compensated. 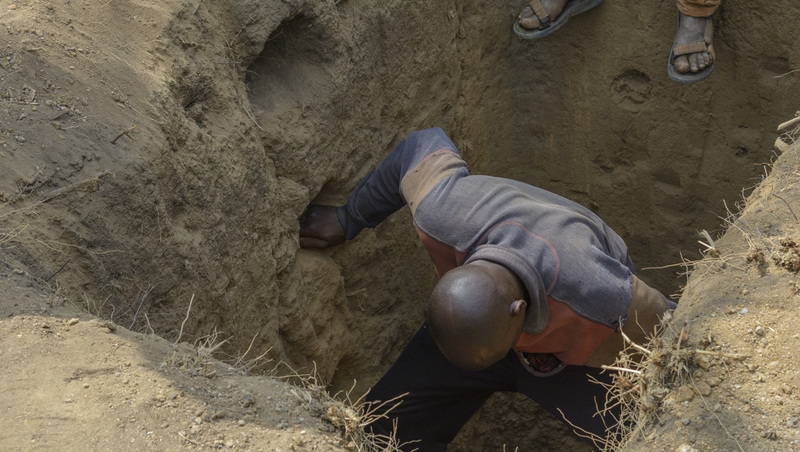 When asked if the local people felt they were losing out on the right to mine these gems for themselves, Mr. Raman said that more than 90% of the unlicensed miners were not local, and in fact many were not even from Mozambique. This was confirmed by our discussions with unlicensed miners who came from all over Mozambique. 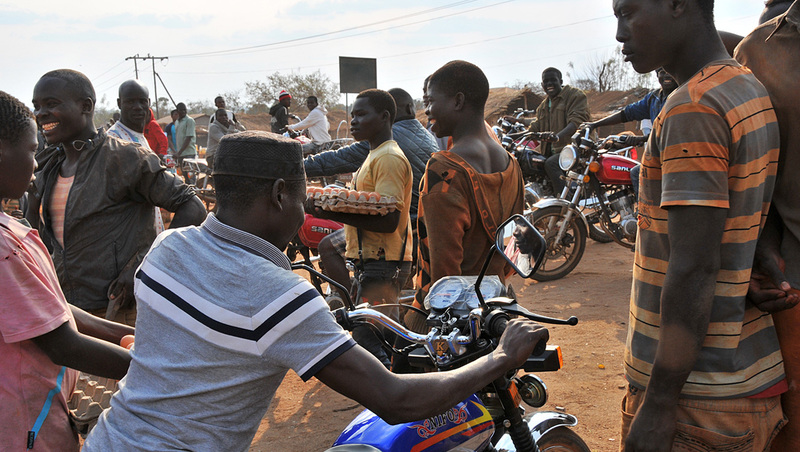 Many of the traders financing their activities, whom we met in Namahumbire or at the mining and washing sites, were from neighboring Tanzania or West Africa (Guinea, Senegal, Mali, or Nigeria). 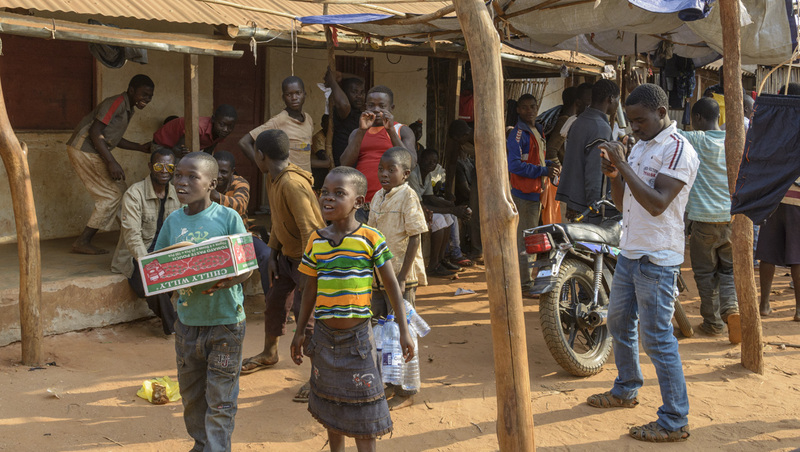 These African traders usually work for merchants in Montepuez who are based out of Thailand, Sri Lanka, or India. We also visited the town of Montepuez and the area where foreign buyers had set up shop and were buying ruby rough. There were about 500 to 600 Thai buyers and 100 to 150 Sri Lankans. The situation there was quite tense. The different buying offices were typically surrounded by metal grids, and armed guards were visible. 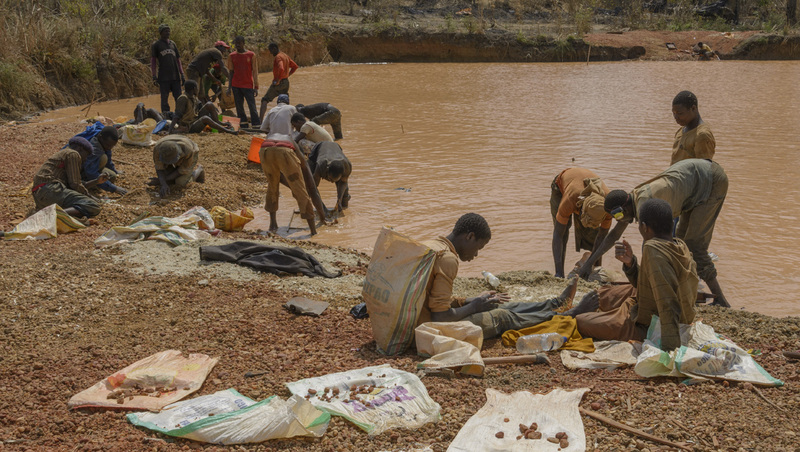 Some of these buyers were the ones financing the unlicensed ruby mining on the MRM concession. This is an office set up by a foreign buyer in the town of Montepuez. Photo by Vincent Pardieu/GIA. The buyers from Thailand we spoke with noted that there were often complications with the authorities and pressing security problems. They felt vulnerable to robbery and theft but were in a precarious situation with local law enforcement. None felt comfortable enough to discuss the situation on camera. 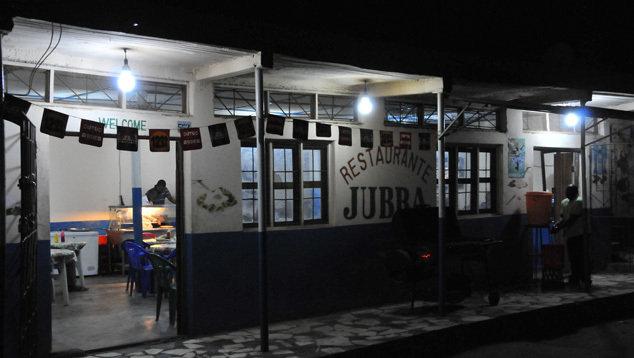 This restaurant in Montepuez is located in an area where the foreign buyers live. Photo by Vincent Pardieu/GIA. 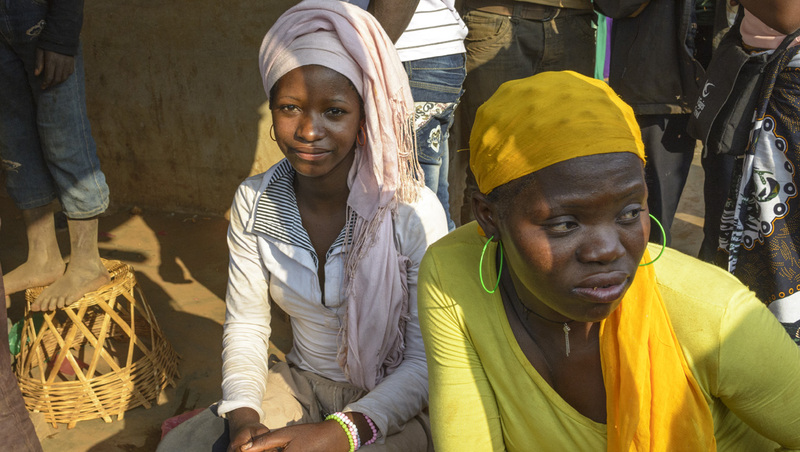 Most of the people selling stones to foreign buyers were intermediaries from other parts of Africa such as Guinea, Mali, Nigeria, and Senegal. The market was busiest in the morning. The Thai buyers offered mixed reports about the market activity and the quantity of goods for sale. A number of buyers from Thailand, Sri Lanka, and China all cluster in the same area to do business. Photo by Vincent Pardieu/GIA. Among the foreign ruby buyers, we came across two Sri Lankans who were very willing to talk with us on camera and give details about the market. Both dealers said production available to the market was strong, especially for commercial-quality goods that could be cut into calibrated sizes such as 4 mm rounds. They decline to buy these parcels, however, as their market is for larger, better-quality, and higher-priced material. They showed us commercial licenses issued by the local Montepuez government but said there were often still complications in doing business legally. The Sri Lankan dealers were proud of the relationships they had built with the locals and pointed to their participation in projects, such as well digging, that benefited the communities. About 90% of MRM’s employees are local inhabitants. The company supports the workforce not only through salary and benefits but also by helping them develop skill sets that can be used after the deposit is depleted. 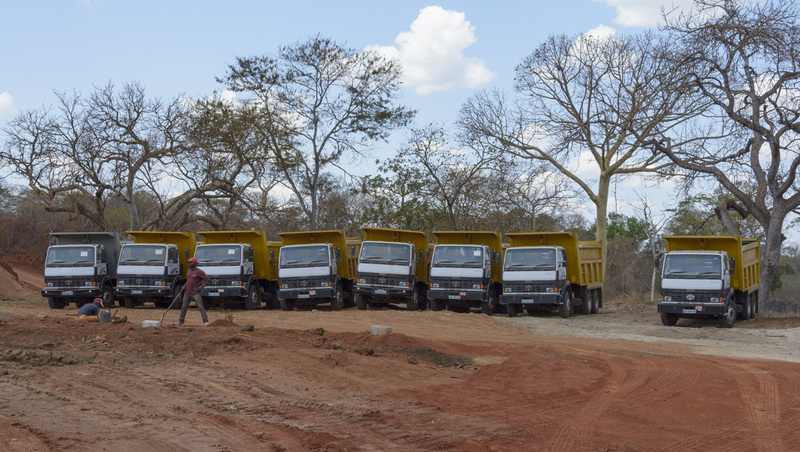 The company employs around 600 people and is reportedly one of the largest taxpayers in Mozambique. 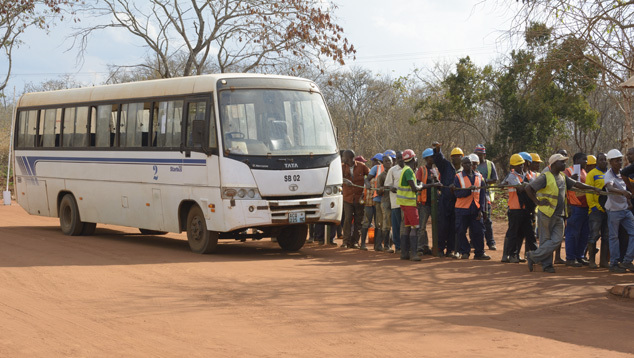 The company’s hiring of local residents to work in the bulk sampling project is part of MRM’s commitment to the community and one of the needs expressed to Mwiriti by the community leaders. MRM is the first employer some of them had ever worked for. 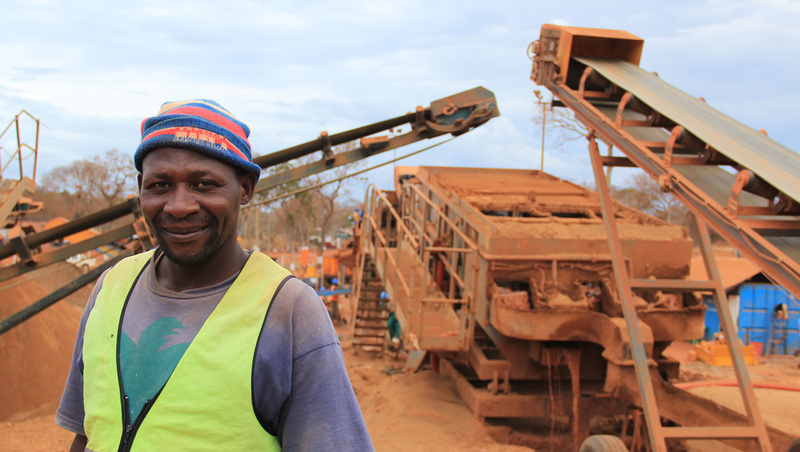 They had never been exposed to the skills needed to work for a mining corporation, but MRM made the commitment to train them to be productive employees. One of the benefits of the Gemfields auction system is that it creates a precise and trusted evaluation system for paying taxes. 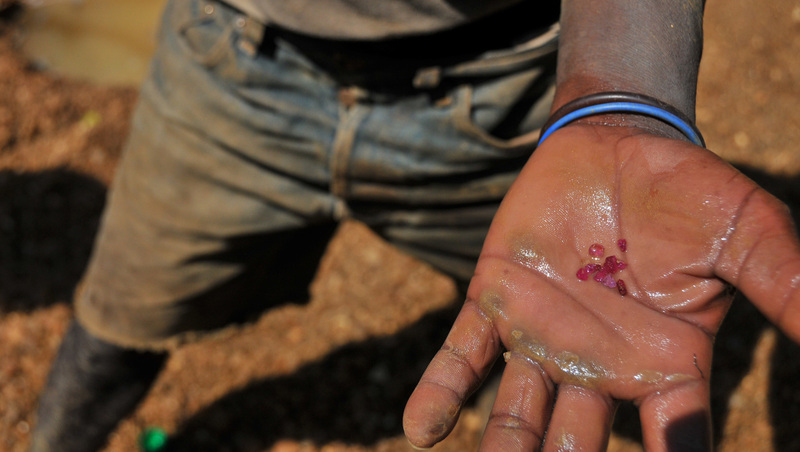 Mozambique’s government originally wanted to tax the rough rubies before they left the country. 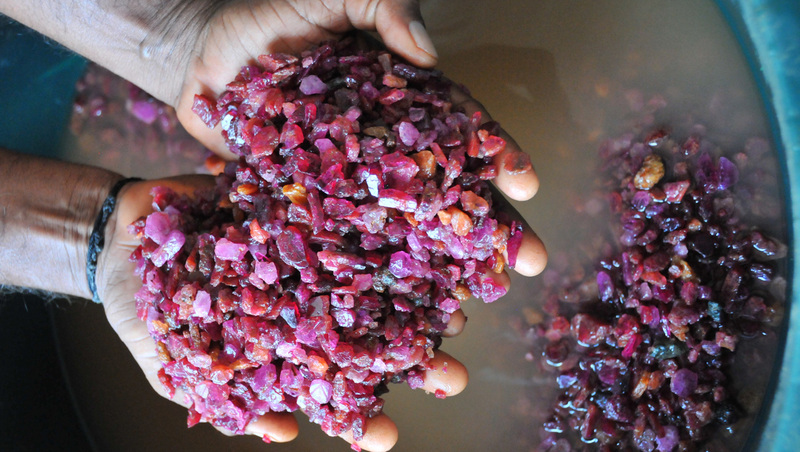 Gemfields was able to convince them, with input from Mwiriti, that it was not feasible to accurately value the rubies until they had been auctioned. After the auction the true market value would be realized and a proper tax could be assessed. The government agreed, and the taxes were levied based on the results of the auction in Singapore. The large amount of ruby produced by MRM allowed Gemfields to offer goods in a wide variety of qualities at their recent Singapore ruby auction. Photo by Andrew Lucas/GIA. Two of the authors had attended the inaugural Mozambique rough ruby auction in Singapore, held June 12–17, 2014. The auction was a resounding success. Fifty-five companies placed bids—a record number for any Gemfields auction. Fifty-seven of the 62 offered lots were sold, 91% by value and 90% by weight. Out of the 2.03 million carats of rough ruby offered, 1.83 million carats were sold. The total revenue generated was US$33.5 million. By comparison, the total expenditure by Gemfields on the Montepuez mine by the time of the auction was US$34 million. The dealers at the event expressed their satisfaction with the parcels and the grading system, and how the auction was conducted. Only occasionally do gemologists have the opportunity to be part of or to document events that can change the direction of the industry. This is true for both laboratory and field gemologists. Laboratory gemologists may discover a new synthetic or treatment on the market and how to identify it. They may also be the first ones to document the properties of stones from a new source. Field gemologists may visit new sources, see new production from existing sources, observe new manufacturing processes and centers, and see how trading and consuming markets shift. 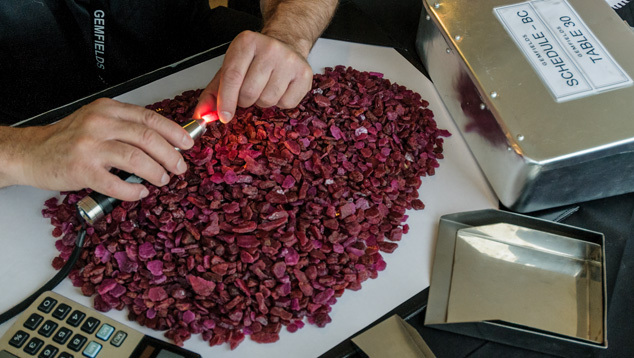 This expedition to the Montepuez ruby mine and the visit earlier this year to the inaugural auction in Singapore enabled the authors to document events that can change the ruby industry and even the colored gemstone industry. Dr. Tao Hsu is technical editor of Gems & Gemology. Andrew Lucas is manager of field gemology for content strategy at GIA in Carlsbad, and Vincent Pardieu is senior manager of field gemology at GIA in Bangkok. 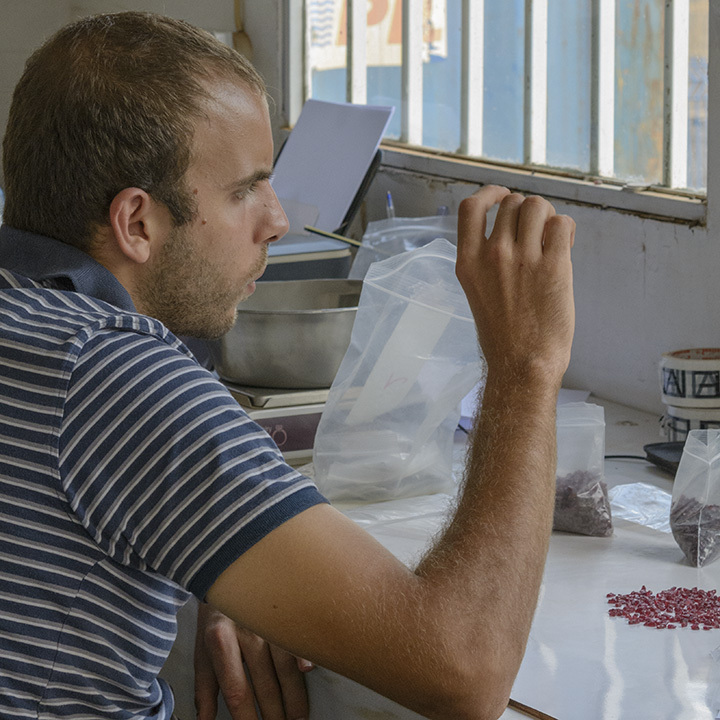 GIA staff often visit mines, manufacturers, retailers and others in the gem and jewelry industry for research purposes and to gain insight into the marketplace. GIA appreciates the access and information provided during these visits. These visits and any resulting articles or publications should not be taken or used as an endorsement. The authors gratefully acknowledge the assistance provided by Gemfields and MRM personnel, including Ian Harebottle, CEO; Adrian Banks, product director; Ashim Roy, head of geology and exploration; Raime Raimundo Pachinupa, executive director; Sanjay Kumar, project manager; Philippe Ressigeac, assistant product manager; Mohun Raman, head of security; and Angus Barthram, logistics manager. Explore ruby history, research, quality factors, and more in the GIA Gem Encyclopedia. Get all the content featured in the most recent issue of Gems & Gemology, as well as access to every issue of the quarterly journal since 1934. Visitors to the GIA World Headquarters in Carlsbad, California can experience a vast and vibrant world of gems and jewelry. Exhibits showcase the science and beauty of gems and minerals, along with expertly designed and crafted jewelry. Search GIA's library catalog of 57,000 books, 1,800 videos, 700 periodicals, and the renowned Cartier Rare Book Repository and Archive.